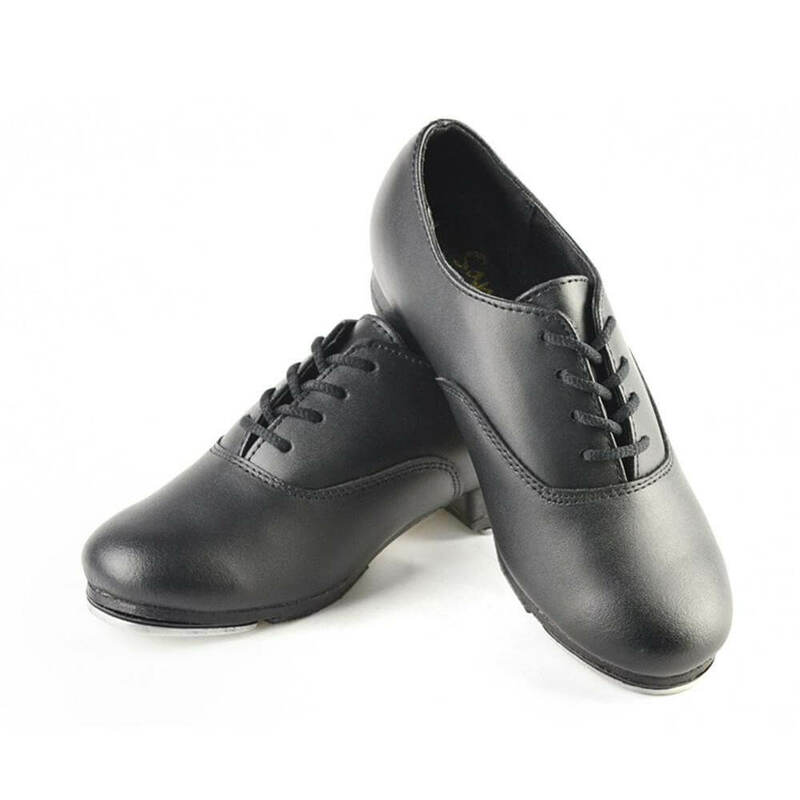 Latest Tap Shoes in a variety of men's, women's and kids styles from top dancewear brands. 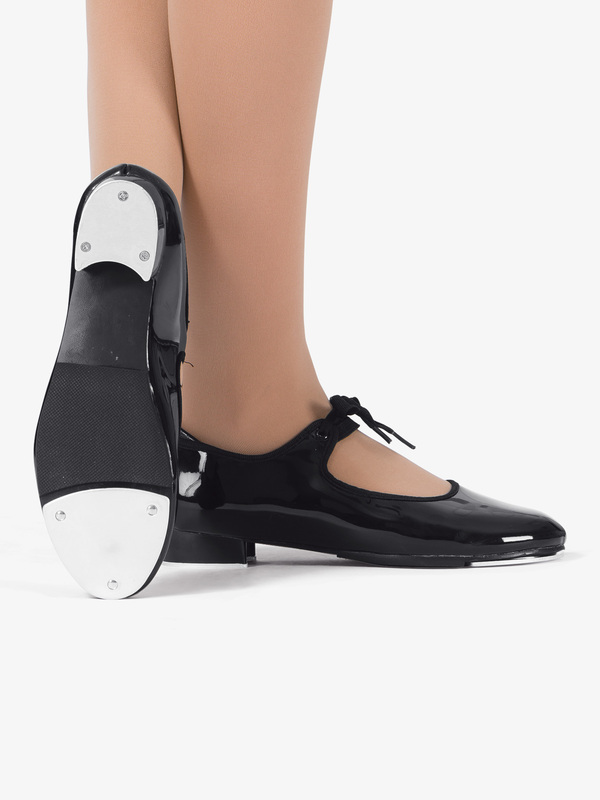 Capezio Adult Manhattan Xtreme 2.5 Heel Tap Shoes 657: Capezio's Manhattan Xtreme-inch tap shoe features a soft and durable leather upper, full leather lining, foam cushioned footbed and a non-slip heel counter. The 2 ½-inch heel is fully wrapped in leather and it's flared design provide a larger strike zone for increased stability. Superior TeleTone toe and heel taps sit on a spring steel soundboard that allow sound to resonate and reach its Xtreme-inch sound potential. Scored rubber sole patch for traction and control. 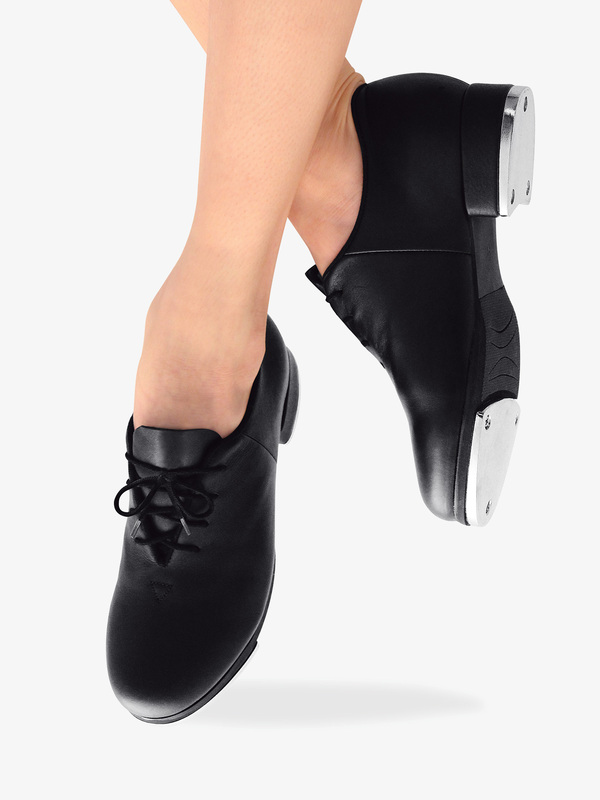 Capezio Adult Premiere Lace Up Tap Shoes CG09: Introducing the new and improved CG09 from Capezio. They have just made their most popular tap shoe better than ever. Featuring a full grain leather upper, leather sole and foam cushioned footbed. Other features include a sturdy toe box and a lightly padded collar and Achilles notch for added comfort. TeleTone Rayow tap allows you to tune your tap with an easy turn of the screw. Capezio Adult FlexMaster Split-Sole Lace Up Tap Shoes CG16: Capezio's FlexMaster-inch split-sole tap shoe features TeleTone toe taps on the leather mounted forepart, adding weight to help produce a deeper resonating sound. This shoe also offers a strong toe box and the Poron insole provides shock absorption and extra-plush comfort. 3/4-inch heel. 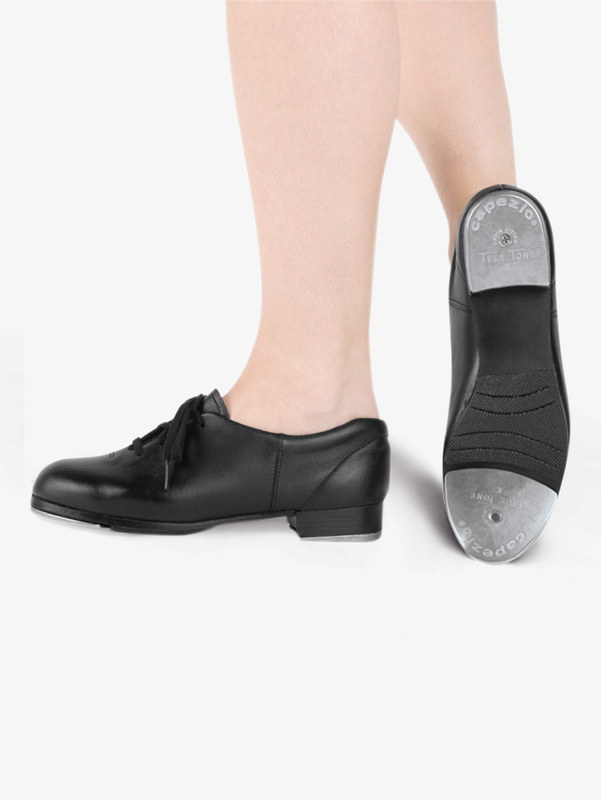 Capezio Child FlexMaster Split-Sole Lace Up Tap Shoes CG16C: Capezio's FlexMaster-inch split-sole tap shoe features TeleTone toe taps on the leather mounted forepart, adding weight to help produce a deeper resonating sound. This shoe also offers a strong toe box and the Poron insole provides shock absorption and extra-plush comfort. 3/4-inch heel. 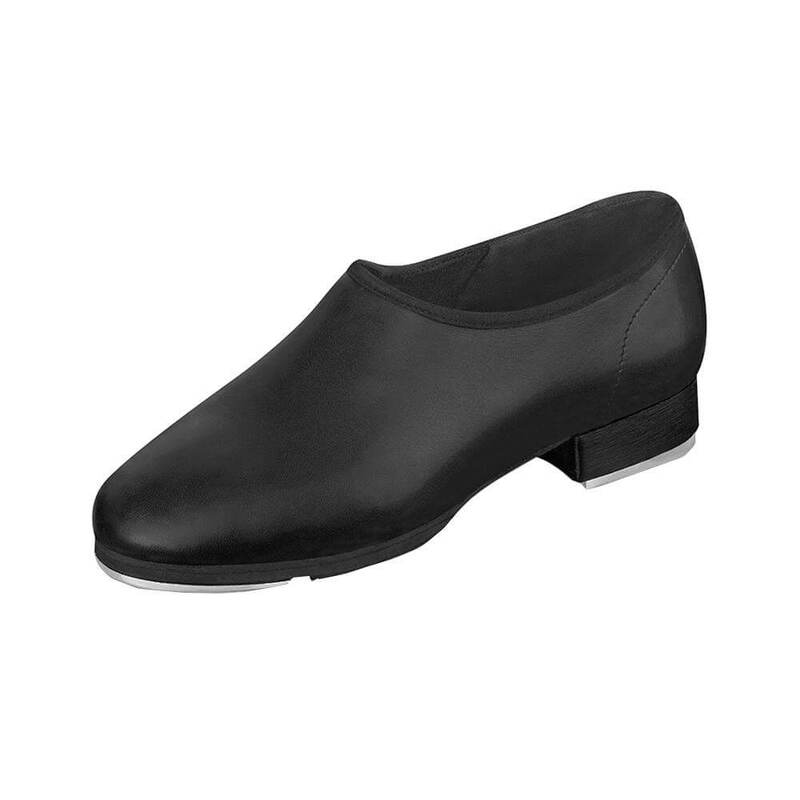 Theatricals Neoprene Insert Adult Tap Shoes T9100: Economy slip-on tap shoe features an innovative neoprene arch insert that makes it easy to slip on and off and accommodates various foot widths while still providing excellent fit. Other features include a man-made leather upper, molded taps with sound board, and a non-skid rubber patch. 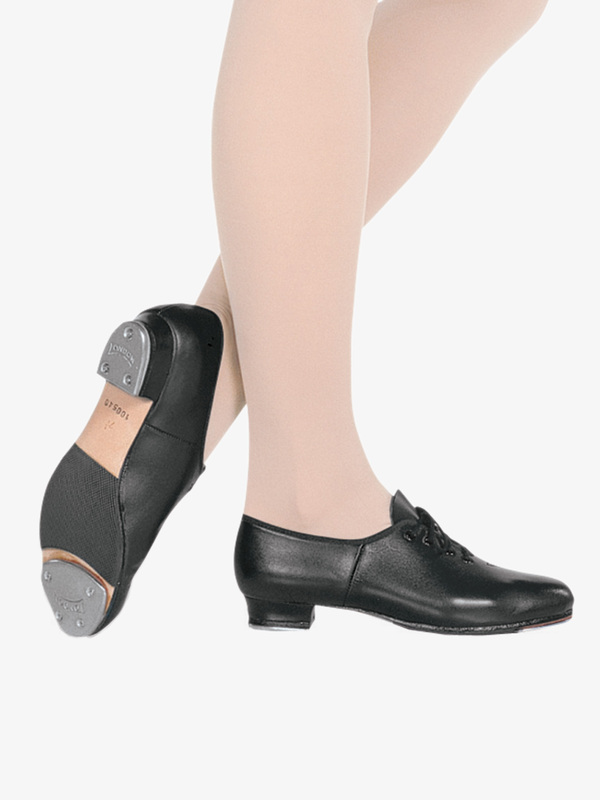 Theatricals Neoprene Insert Child Tap Shoes T9100C: Economy slip-on tap shoe features an innovative neoprene arch insert that makes it easy to slip on and off and accommodates various foot widths while still providing excellent fit. Other features include a man-made leather upper, molded taps with sound board, and a non-skid rubber patch. 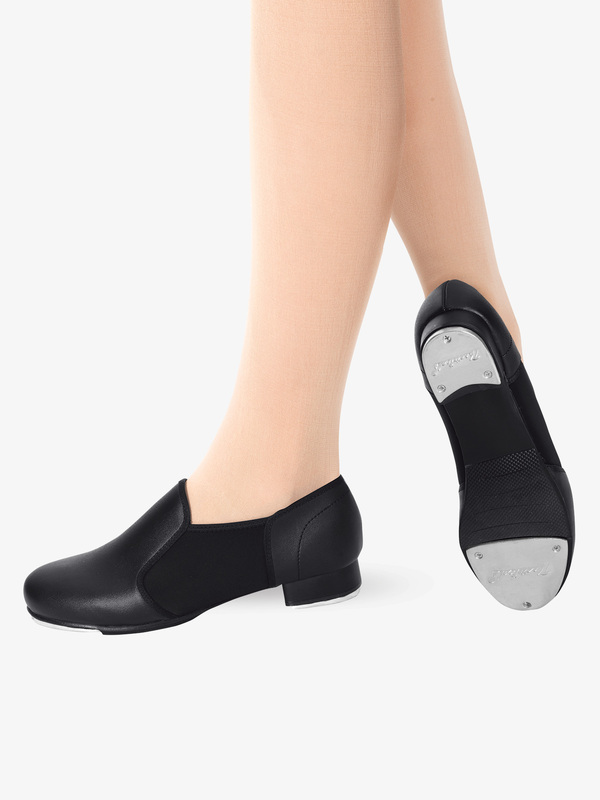 Theatricals Adult Slide Buckle Tap Shoes T9200: Mary Jane-inch tap shoe has a man-made upper and features a non-skid rubber pad, a cushioned sock lining, and an Achilles pad for a comfortable fit. No-lip toe tap and heel taps attached by rivets. Also features a buckle strap with an adjustable slide buckle. No need to worry about ribbon ties coming undone during class with this durable strap in place. The black patent features a PVC upper while the other colors feature a matte PU upper. Theatricals Child Slide Buckle Tap Shoes T9200C: Mary Jane-inch tap shoe has a man-made upper and features a non-skid rubber pad, a cushioned sock lining, and an Achilles pad for a comfortable fit. 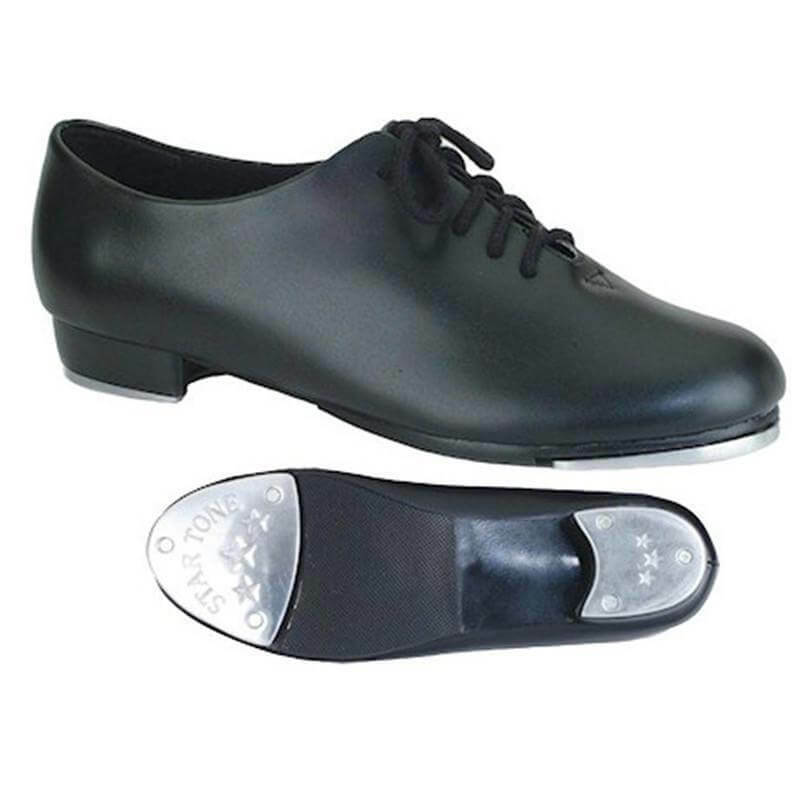 No-lip toe tap and heel taps attached by rivets. Also features a buckle strap with an adjustable slide buckle. No need to worry about ribbon ties coming undone during class with this durable strap in place. The black patent features a PVC upper while the other colors feature a matte PU upper. 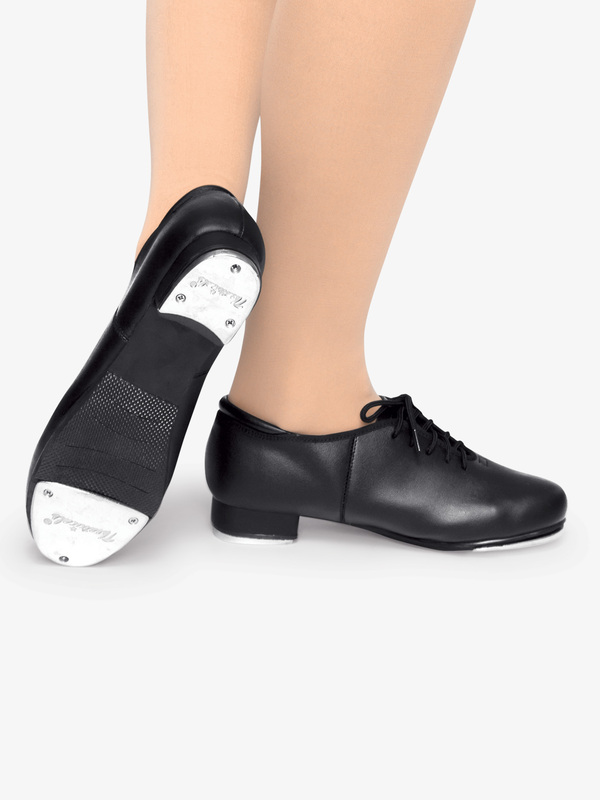 Theatricals Girls TapRite Molded Tap Slide Buckle Tap Shoes T9415C: The TapRite-inch tap shoe has a man-made upper and comes with upgraded casted or molded taps for a superior sound. 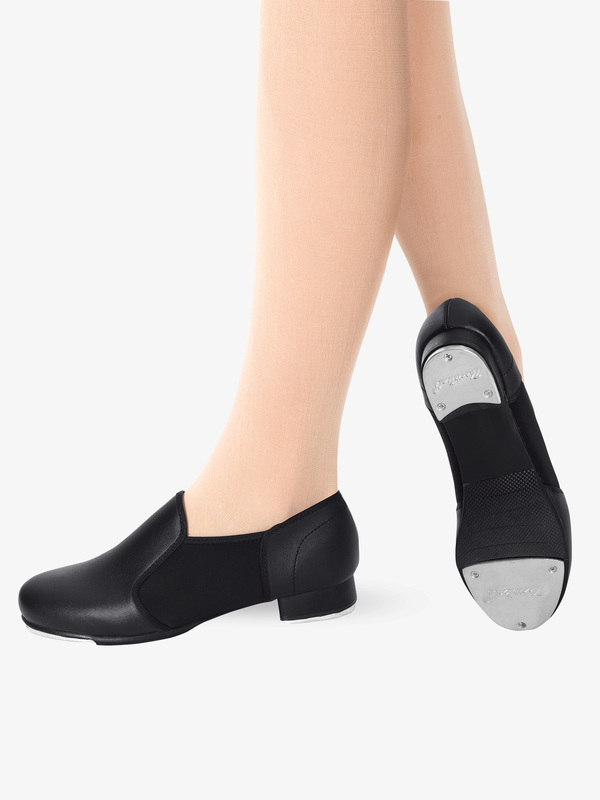 Shoe features a graduated heel for the more advanced dancer, a cushioned sock lining, an achilles pad for a more comfortable fit, and a non-skid rubber pad. 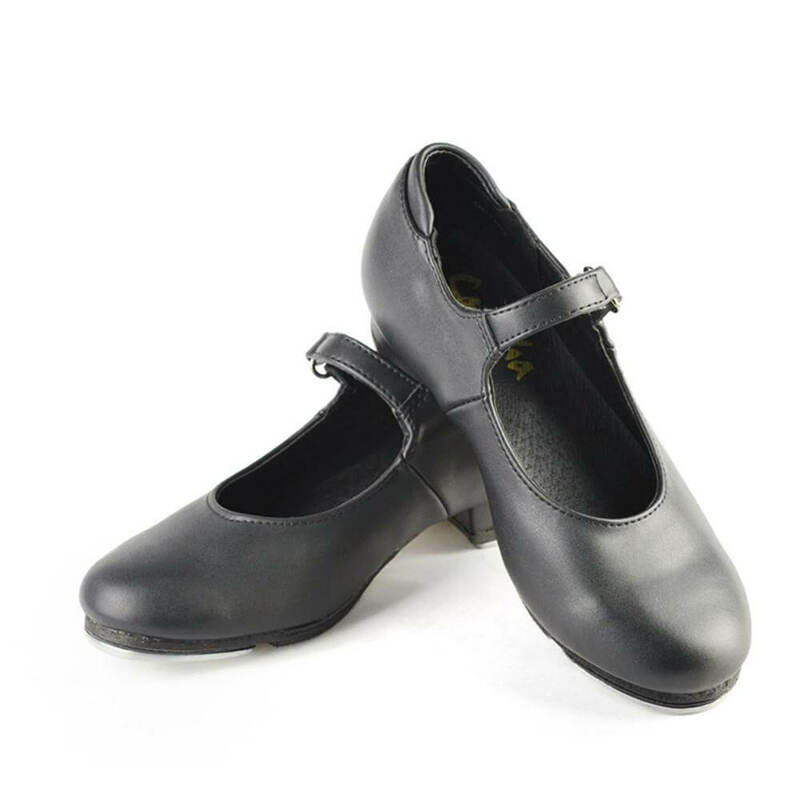 For added security, shoe is constructed with a buckle strap and an adjustable slide buckle - no need to worry about ribbon ties coming undone during class with this durable strap in place. Black patent features a PVC upper while the other colors feature a matte PU upper. A BEST VALUE product. Bloch Girls Annie Tyette Synthetic Leather Tap Shoes S0350G: Bloch's Annie Tyette-inch tap shoes feature a ribbon tie over a stretchy elastic strap, Bloch's techno tap plates for ultimate sound, a soft, luxurious cashmere lining, a padded insole, a non-slip pro balance outsole pad, and a secure heel with no seam lines to minimize rubbing. Bloch Womens Annie Tyette Synthetic Leather Tap Shoes S0350L: Bloch's Annie Tyette-inch tap shoes feature a ribbon tie over a stretchy elastic strap, Bloch's techno tap plates for ultimate sound, a soft, luxurious cashmere lining, a padded insole, a non-slip pro balance outsole pad, and a secure heel with no seam lines to minimize rubbing. 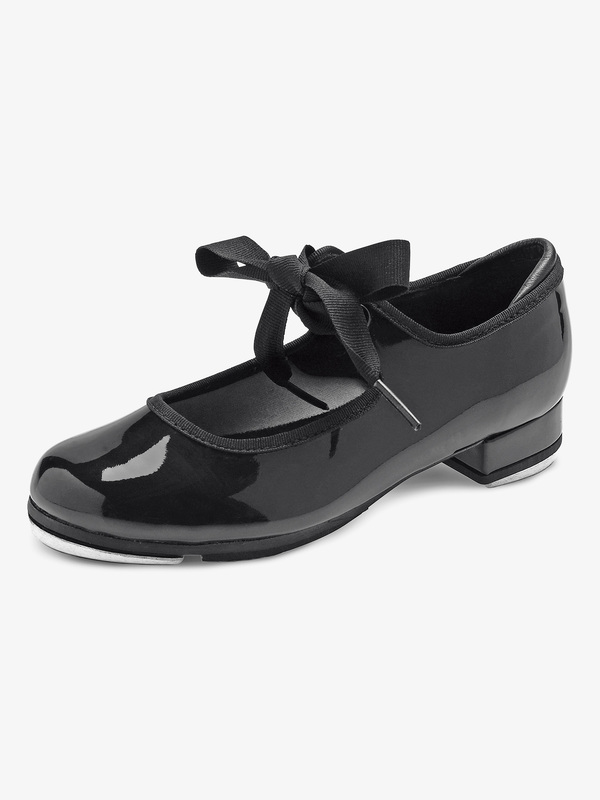 Bloch Toddler Annie Tyette Synthetic Leather Tap Shoes S0350T: Bloch's Annie Tyette-inch tap shoes feature a ribbon tie over a stretchy elastic strap, Bloch's techno tap plates for ultimate sound, a soft, luxurious cashmere lining, a padded insole, a non-slip pro balance outsole pad, and a secure heel with no seam lines to minimize rubbing. 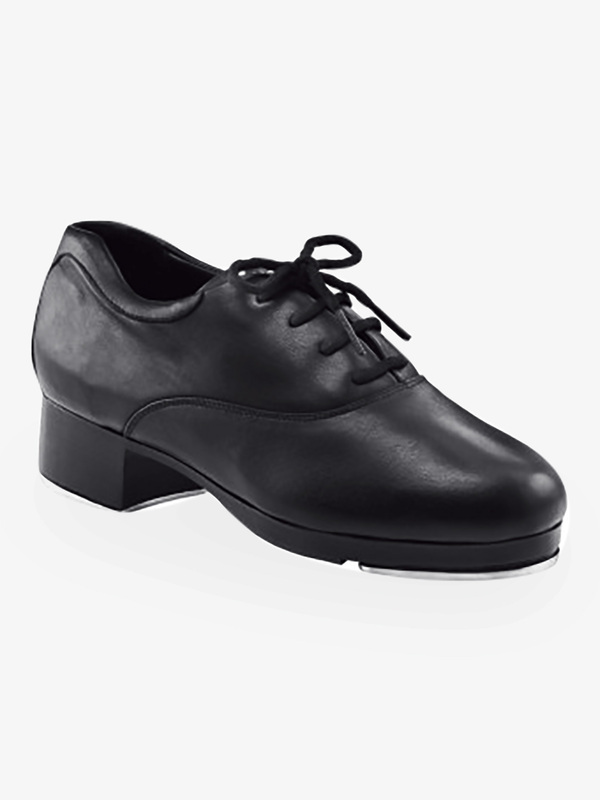 Bloch Adult Audeo Lace Up Tap Shoes S0381L: Bloch's Audeo-inch is a full sole leather tap shoe. This lace-up style offers a cashmere lining, stacked heel and a cushioned insole for comfort and shock absorption. 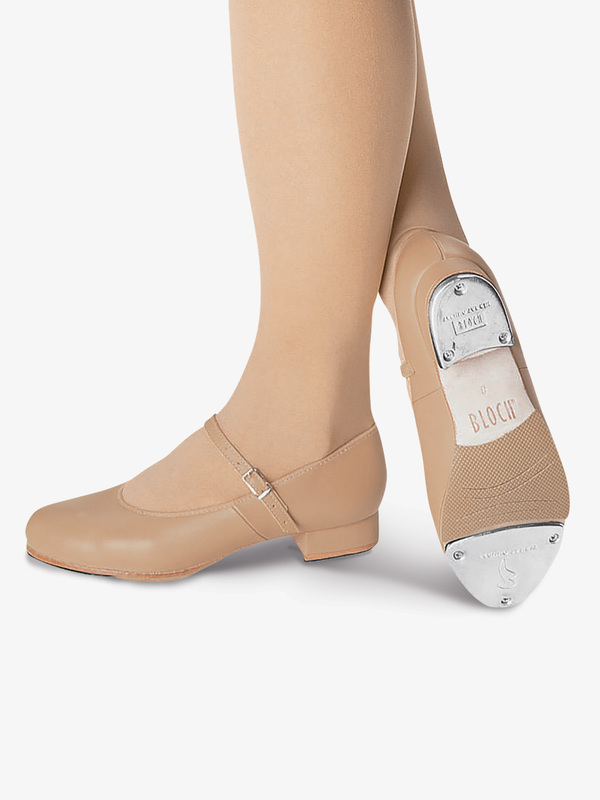 Bloch Child TapFlex Lace Up Tap Shoes S0388G: The Bloch TapFlex-inch is a full leather split-sole tap shoe that features the exclusive Bloch 'sling technique' - allowing the shoe to bend in one direction and resist in another. Shoe also features a wick away lining for reduced moisture and comfort and a heel notch to alleviate pressure on the Achilles. 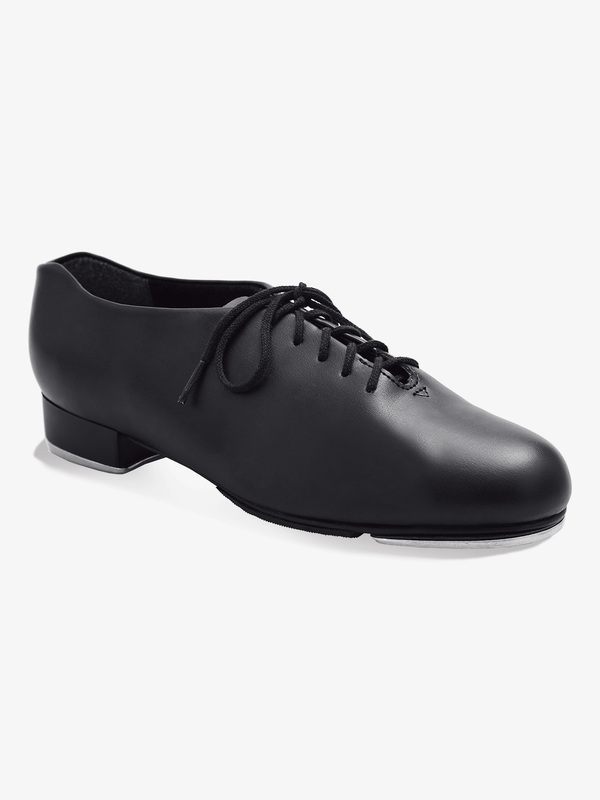 This lace-up style is perfect for any dancer from student to professional. 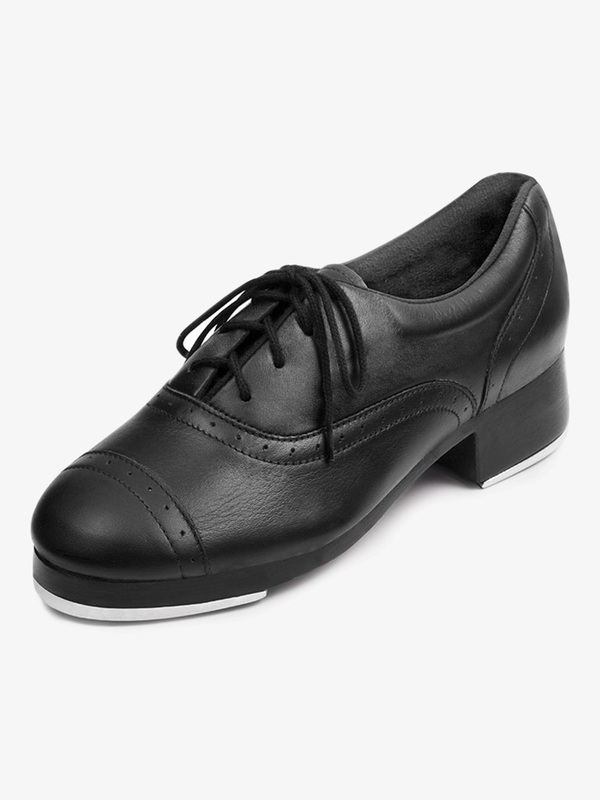 Bloch Adult TapFlex Lace Up Tap Shoes S0388L: The Bloch TapFlex-inch is a full leather split-sole tap shoe that features the exclusive Bloch 'sling technique' - allowing the shoe to bend in one direction and resist in another. Shoe also features a wick away lining for reduced moisture and comfort and a heel notch to alleviate pressure on the Achilles. This lace-up style is perfect for any dancer from student to professional. 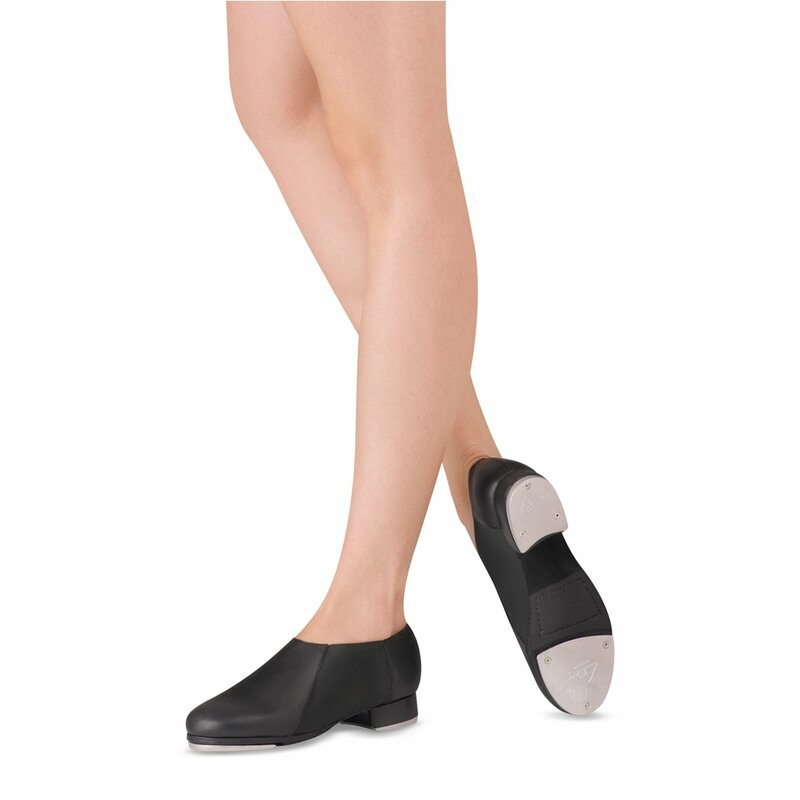 Bloch Adult TapFlex Slip-On Tap Shoes S0389L: Bloch's Tap Flex-inch slip-on split-sole tap shoe features an all leather upper and a new last to achieve perfect form. Upper design shaped to relieve pressure on the Achilles tendon. A leather stacked heel, new tap plates for maximum floor contact, hard edge sound boards and a hard leather outsole all aid in providing the best possible sound when tapping. 3/4-inch heel. 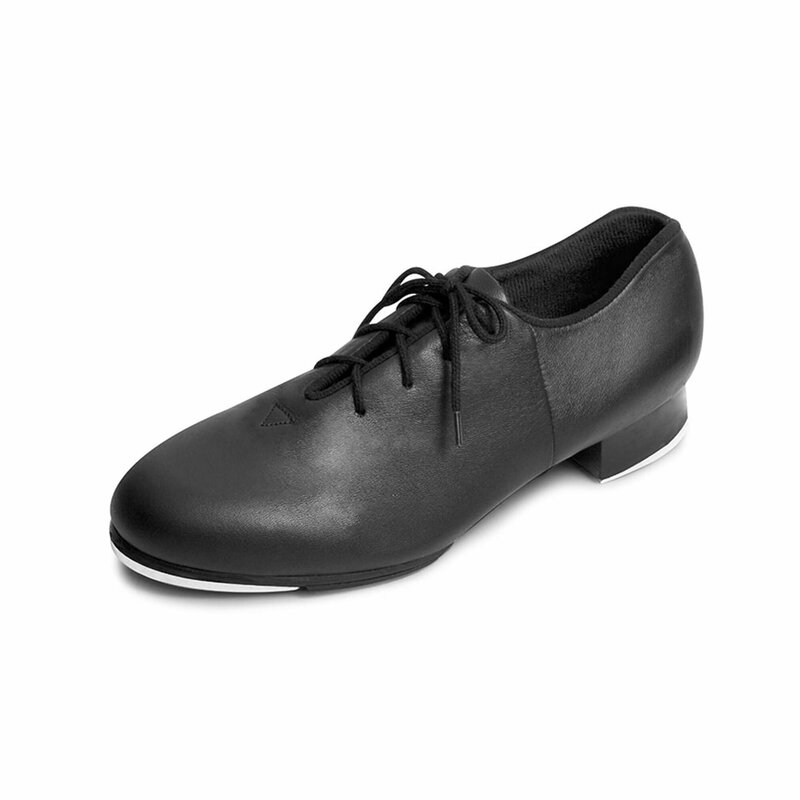 Dance Now Child Unisex Jazz Tap Shoes DN3710G: This economy jazz tap shoe from the Dance Now-inch collection features taps that offer maximum contact for maximum sound. The non-slip pro balance pad is located behind the tap plate. Designed specifically for the beginner, this shoe features a man-made upper and sole, padded insoles and soft lining. Taps are riveted on to the shoe. 3/4-inch heel. 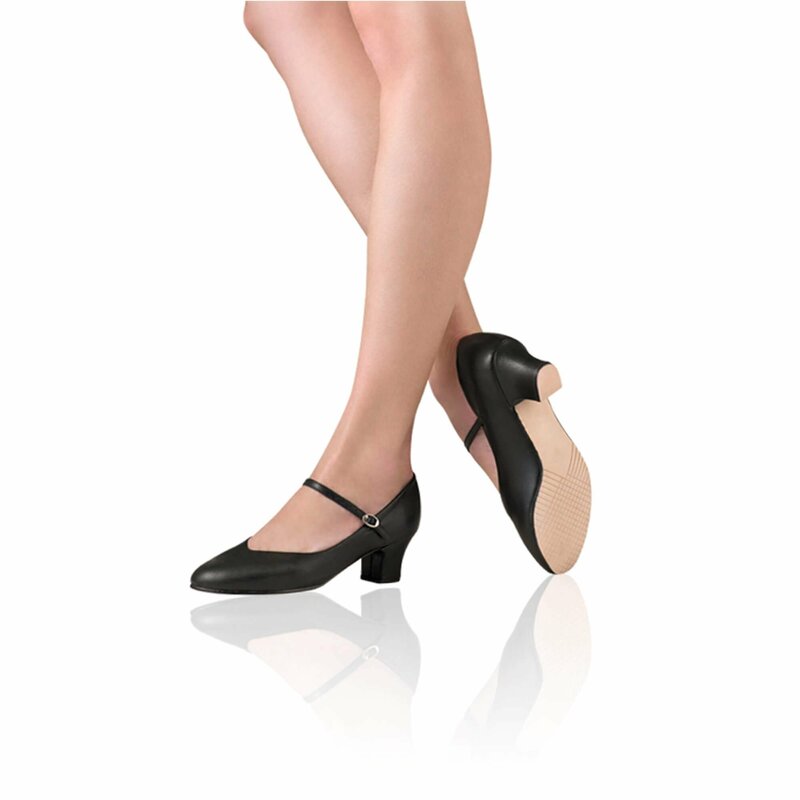 Dance Now Womens Jazz Tap Shoes DN3710L: This economy jazz tap shoe from the Dance Now-inch collection features taps that offer maximum contact for maximum sound. The non-slip pro balance pad is located behind the tap plate. Designed specifically for the beginner, this shoe features a man-made upper and sole, padded insoles and soft lining. Taps are riveted onto the shoe. This shoe has a 3/4-inch heel. 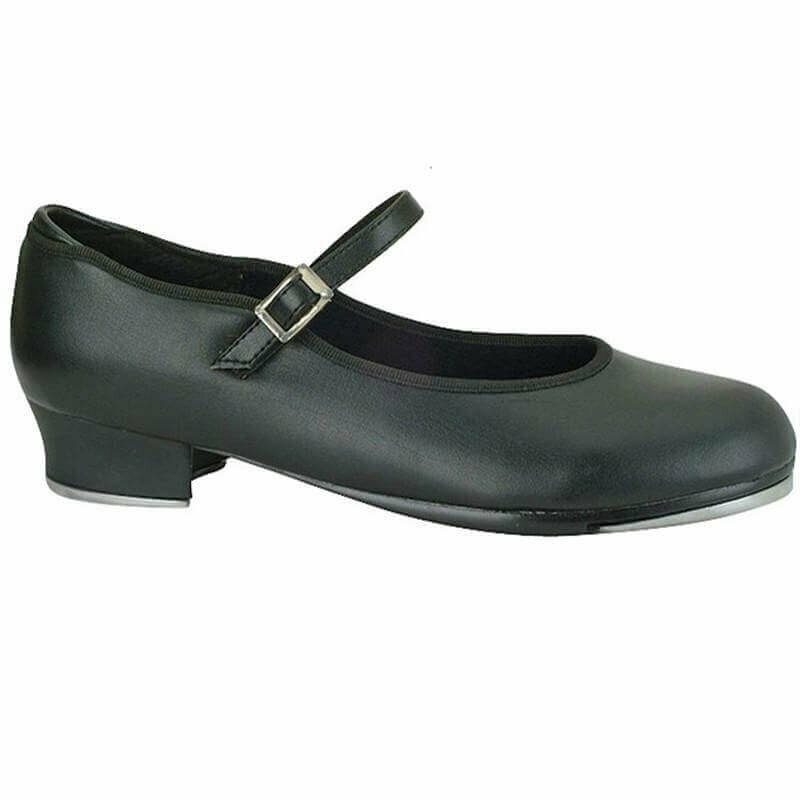 Dance Now Girls Student Tap Shoes DN3720G: Dance Now's student tap shoe features taps that offer maximum contact for maximum sound. The non-slip pro balance pad is located behind the tap. Other features include a man-made upper and sole, padded insoles, and soft lining. 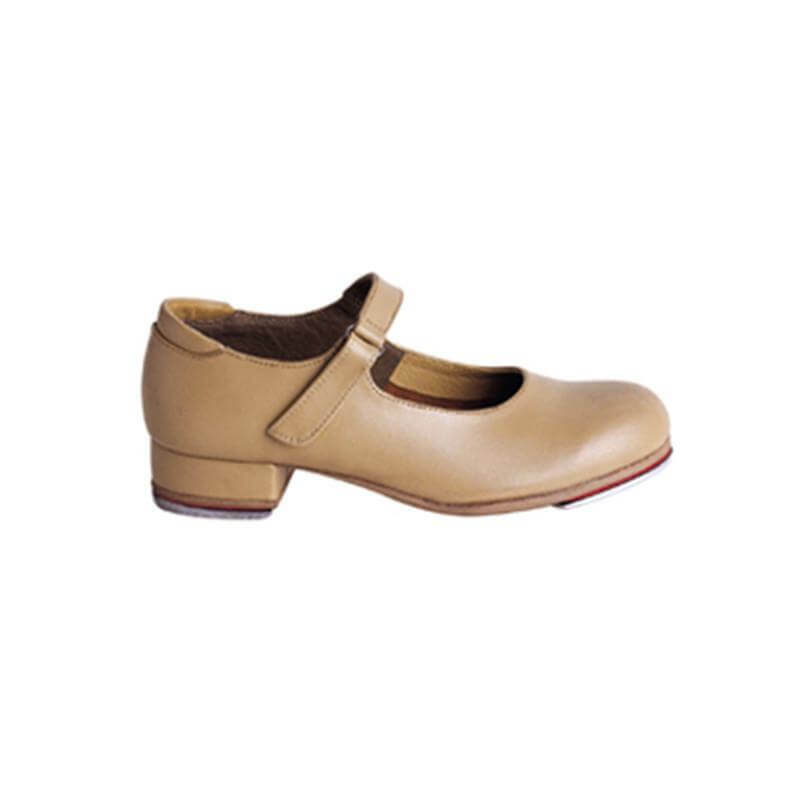 This shoe is packaged with elastic tap ties and matching ribbon allowing two choices of attachment. Taps are riveted onto the shoe. 1/2-inch heel. 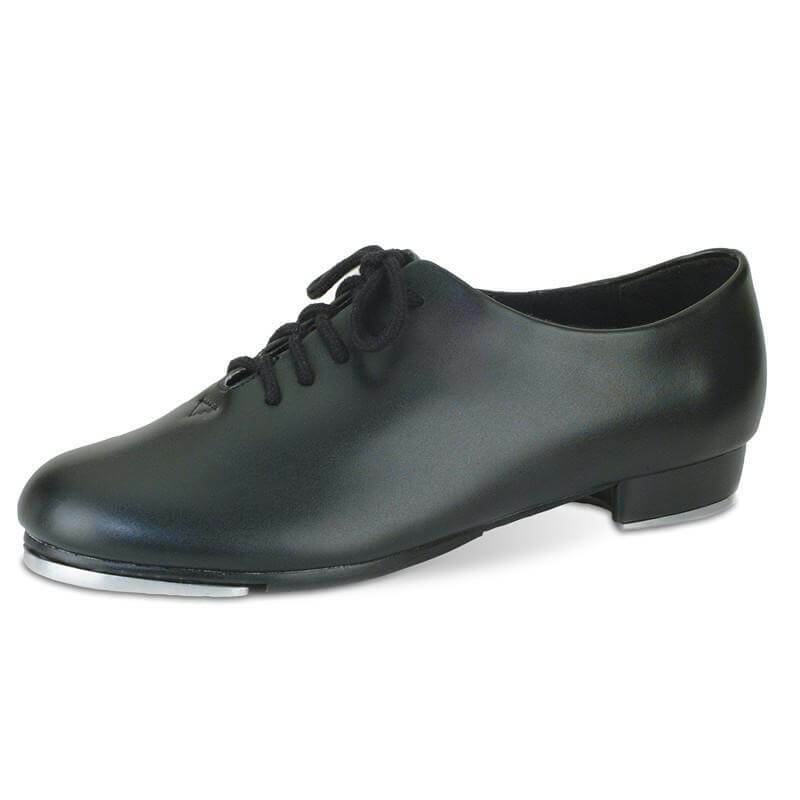 Leo's Adult Giordano Spectator Tap Shoes LS3004L: New and improved fit! This Giordano Spectator Tap features genuine full-grain leather and Leo's biggest sounding Ultratone screw on taps. Other features include a two-piece leather sole for a flexible arch and a one-half stitched on rubber sole with non-slip traction. 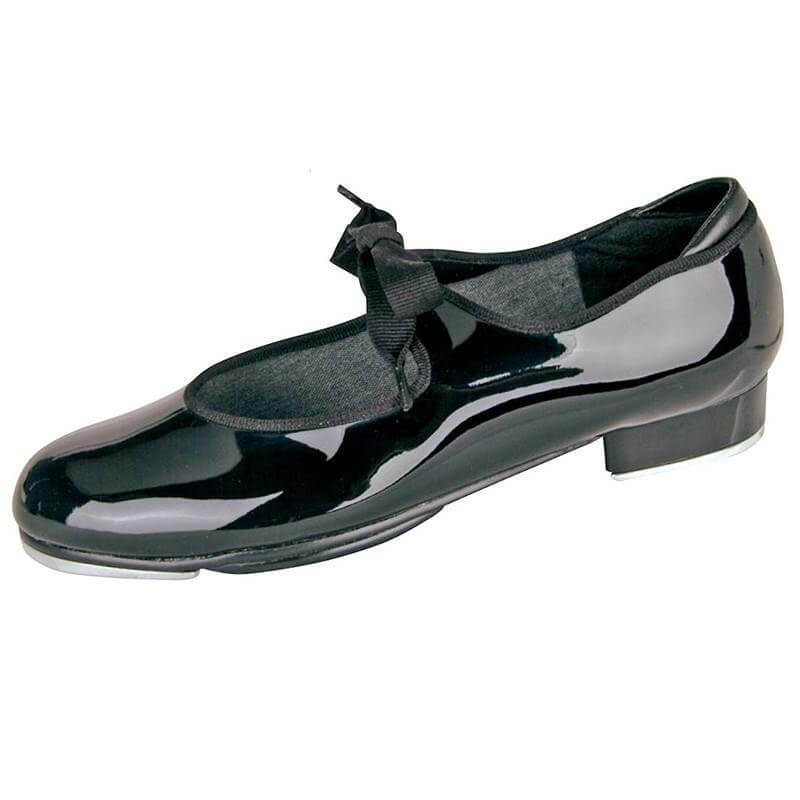 Theatricals Girls Tap Star Ribbon Tie Elastic Tap Shoes T9015C: The Tap Star-inch features a non-slip rubber pad, firm heel counter, light toe box for support, and a snug fit, while maintaining comfort. Other features include a foam padded footbed, an Achilles pad for comfort, elastic sewn in-between the eyelets, and a grosgrain ribbon. The black patent features a PVC upper while other colors feature a PU upper. White and tan colors have a matte finish. A BEST VALUE product. 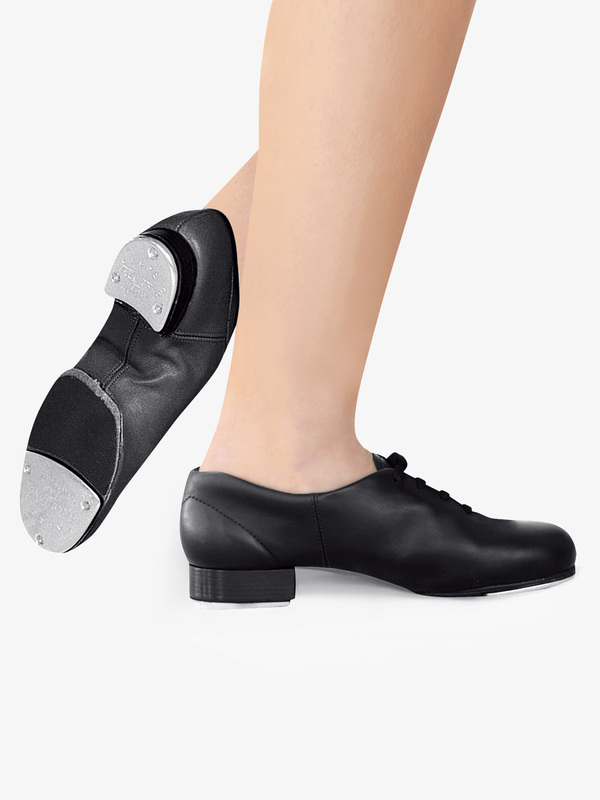 Theatricals Adult Velcro Tap Shoes T9050: Mary Jane-inch style tap shoe features a secure Velcro closure, a rubber sole pad for traction and stability, screw-in heel taps, a padded sole for comfort, and a padded heel collar to help prevent blisters and injuries to the Achilles tendon. The black patent features a PVC upper while the tan features a matte PU upper. 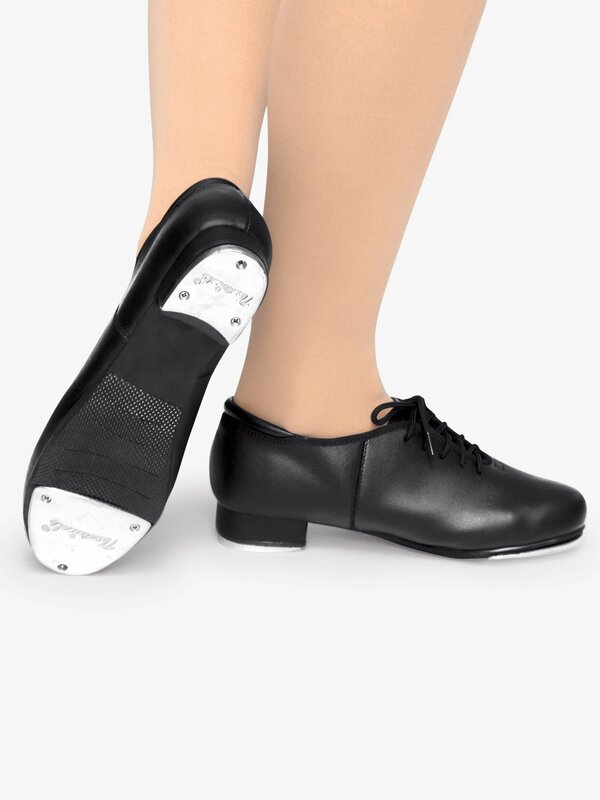 Theatricals Child Velcro Tap Shoes T9050C: Mary Jane-inch style tap shoe features a secure Velcro closure, a rubber sole pad for traction and stability, screw-in heel taps, a padded sole for comfort, and a padded heel collar to help prevent blisters and injuries to the Achilles tendon. The black patent features a PVC upper while the tan features a matte PU upper. 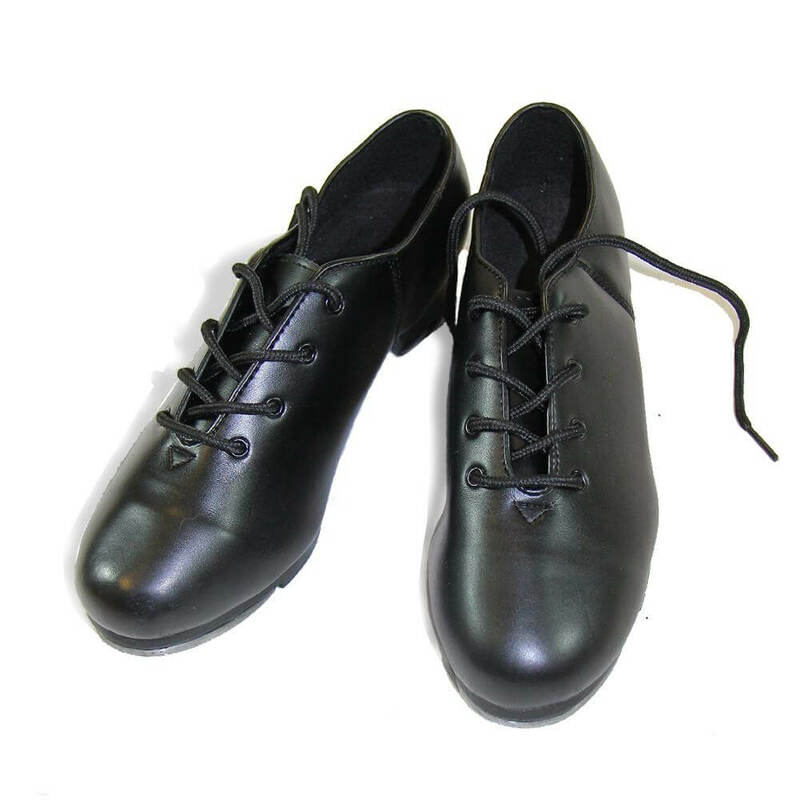 Theatricals Adult Lace Up Tap Shoes T9500: Jazz tap lace up shoe with taps that are screwed on and have a sound board. Other features include a heel counter, a non-skid rubber patch for safety, and a cushioned sock lining for comfort. 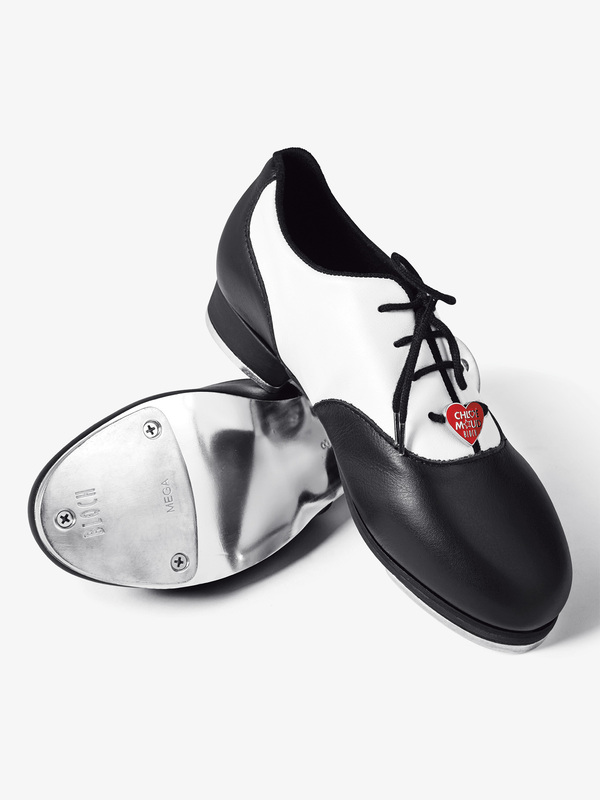 Theatricals Child Lace Up Tap Shoes T9500C: This classic lace-up jazz tap shoe features taps that come screwed on with a sound board underneath. 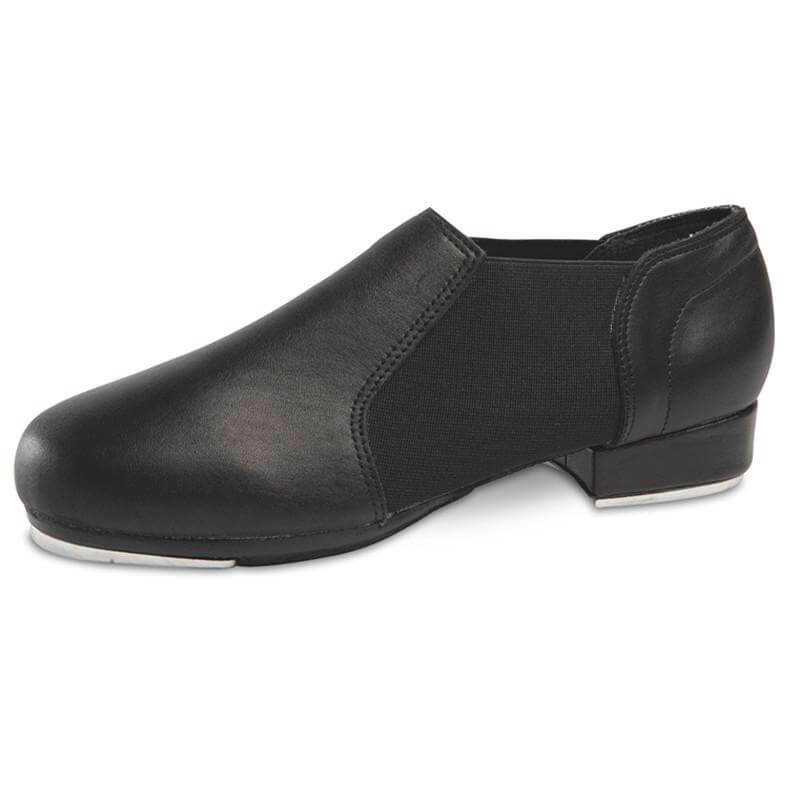 Includes a sturdy heel counter, a non-skid rubber patch behind the taps, and a cushioned sock lining for extra comfort. 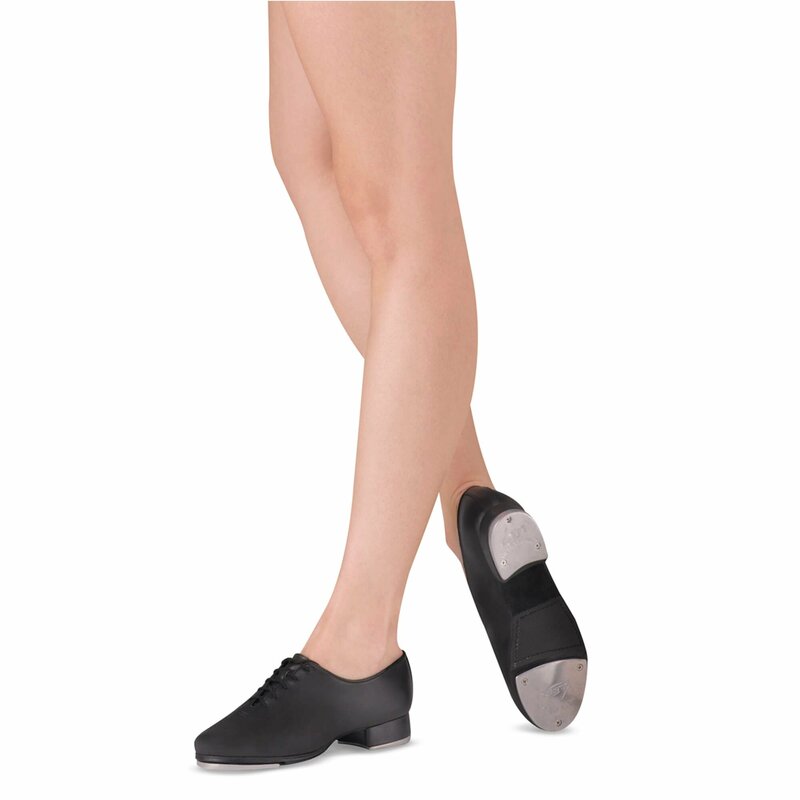 Theatricals Adult Split Sole Tap Shoes T9555: Oxford style jazz tap shoe with a split sole for ease of movement and flexibility though the arch. 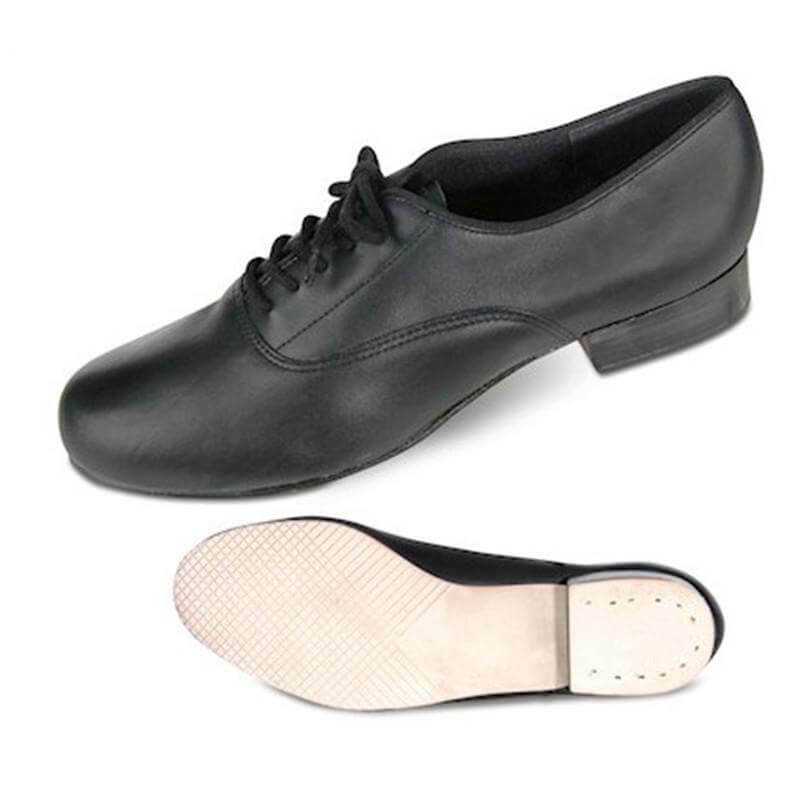 Features include molded, sewn-in taps with sound boards for crisp quality sound, a soft genuine man-made leather upper, a padded sole, a moisture-absorbing liner, and a slit rubber sole pad for traction, flexibility, and durability. 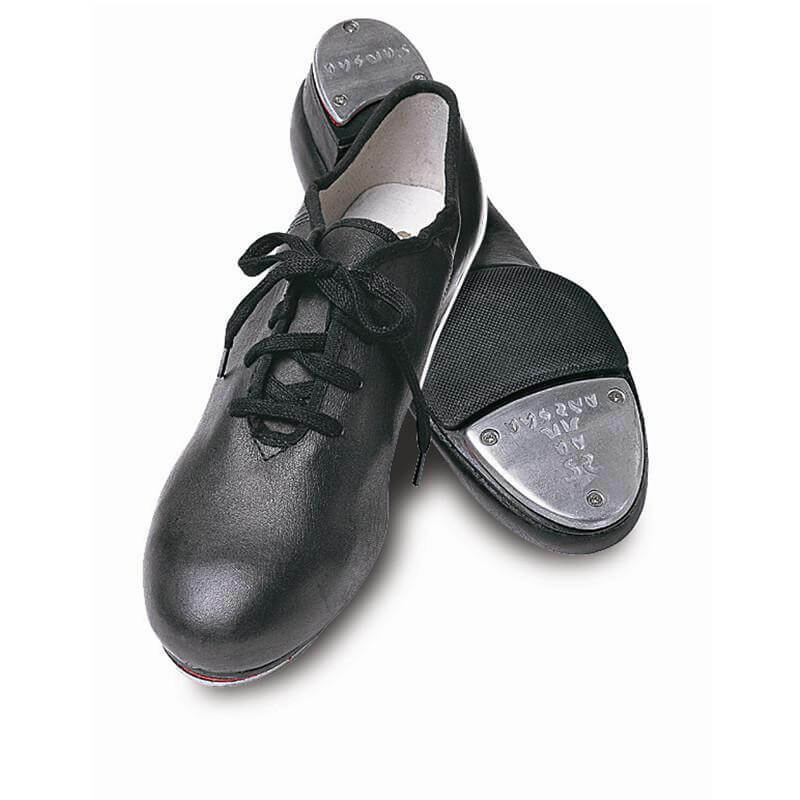 Theatricals Child Split Sole Tap Shoes T9555C: Oxford style jazz tap shoe with a split sole for ease of movement and flexibility though the arch. 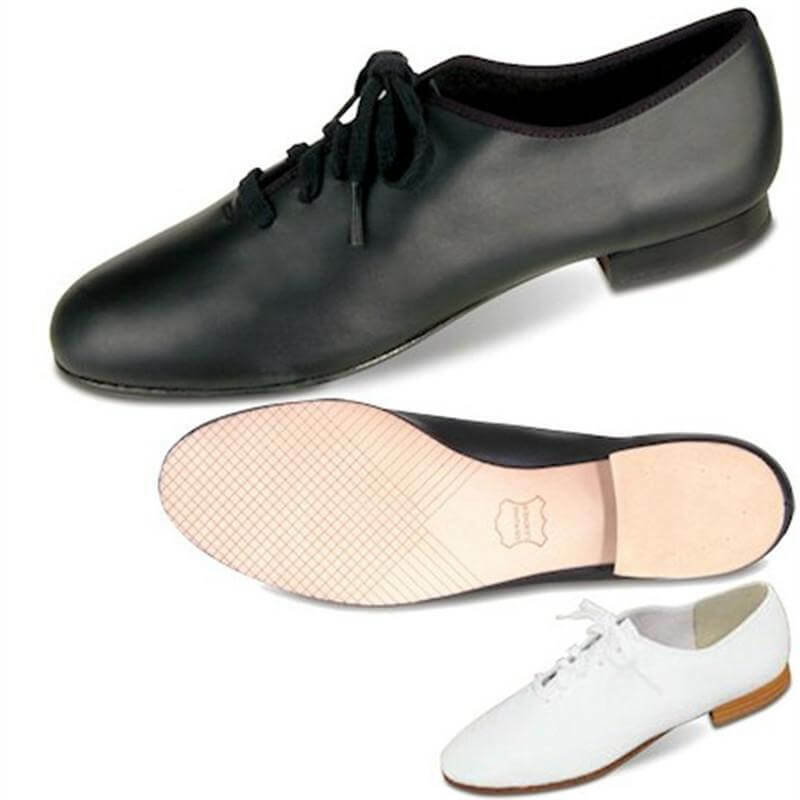 Features include molded, sewn-in taps with sound boards for crisp quality sound, a soft genuine man-made leather upper, a padded sole, a moisture-absorbing liner, and a slit rubber sole pad for traction, flexibility, and durability. 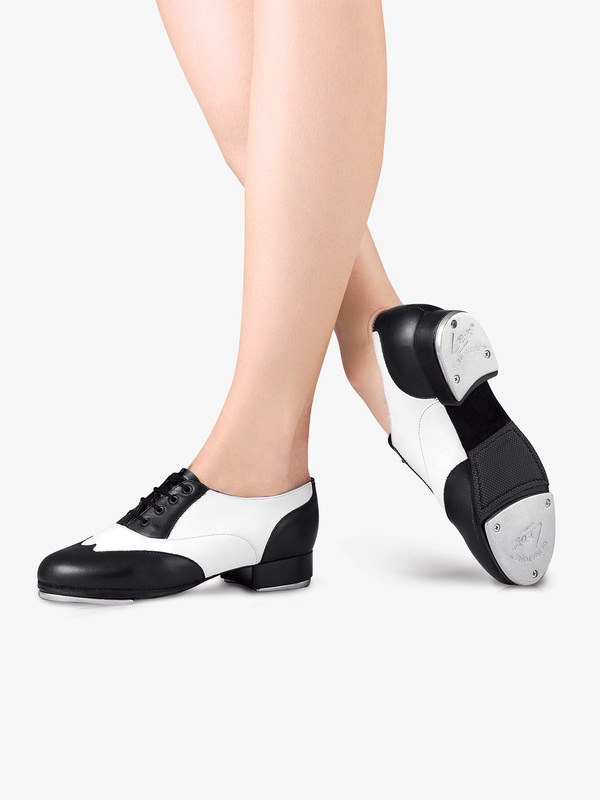 Bloch Womens Jason Samuel Smith Lace Up Tap Shoes S0313L: Bloch's professional tap shoe designed with tap icon Jason Samuels Smith. Leather upper lined with Kashmir to reduce moisture. Double hard leather outsole with triple stacked heel. Steel resonance plates between tap and outsole create optimum depth and pitch of sound. Specially developed metal bonding procedures ensure that screws will not loosen without modification. Heel measures 1.5. Separate slip pad included. 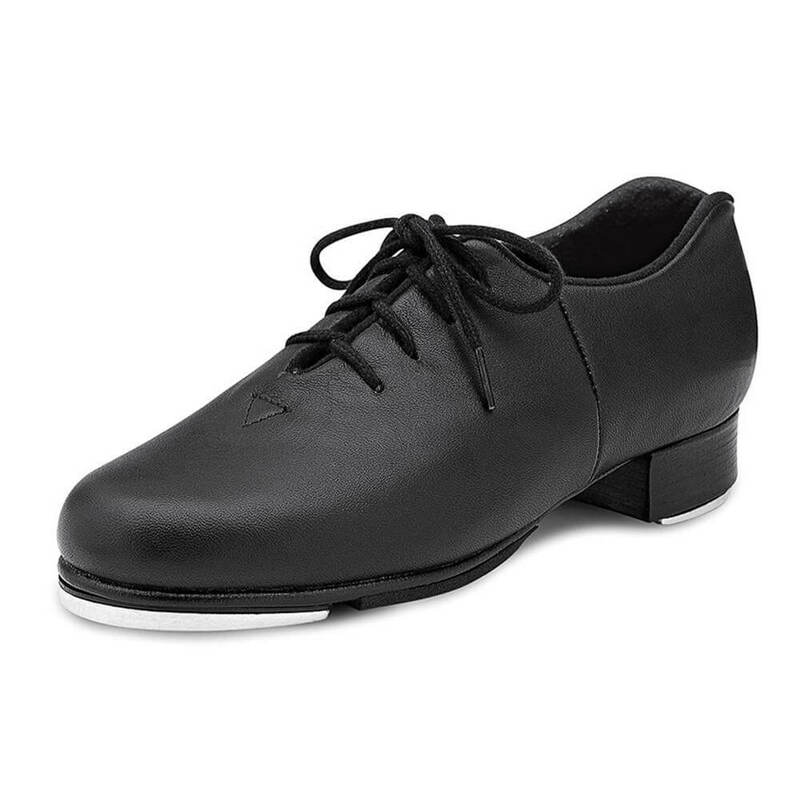 Bloch Mens Jason Samuel Smith Lace Up Tap Shoes S0313M: Bloch's professional tap shoe designed with tap icon Jason Samuels Smith. Leather upper lined with Kashmir to reduce moisture. Double hard leather outsole with triple stacked heel. Steel resonance plates between tap and outsole create optimum depth and pitch of sound. Specially developed metal bonding procedures ensure that screws will not loosen without modification. Heel measures 1.5. Separate slip pad included. 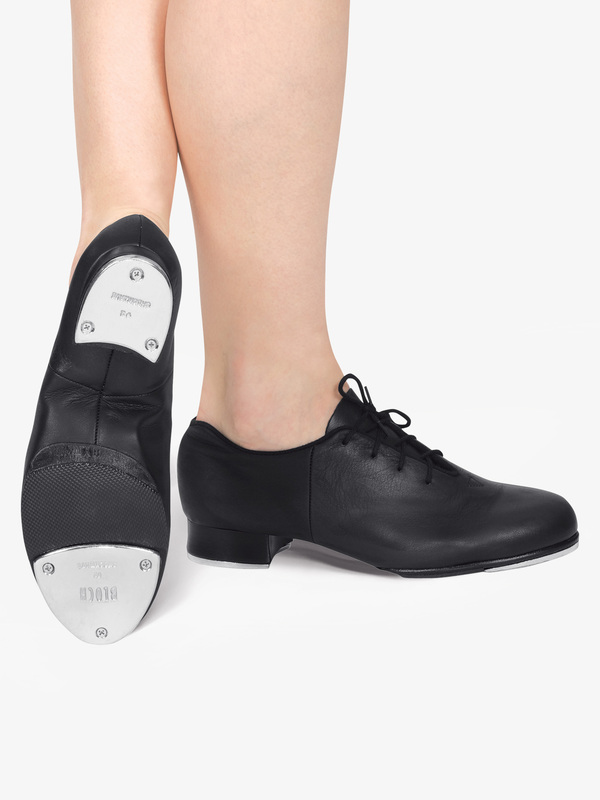 Bloch Adult Sync Lace Up Tap Shoes S0321L: Designed with 70% more metal than regular tap shoes, the Sync oxford-style lace up tap shoe by Bloch will provide a powerful sound, whether you're on stage or at practice. Features include a leather upper with reinforced eyelets, a pro-balance rubber pad attached at the ball of the foot for a non-slip sole, and a cushioned insole for shock absorption. 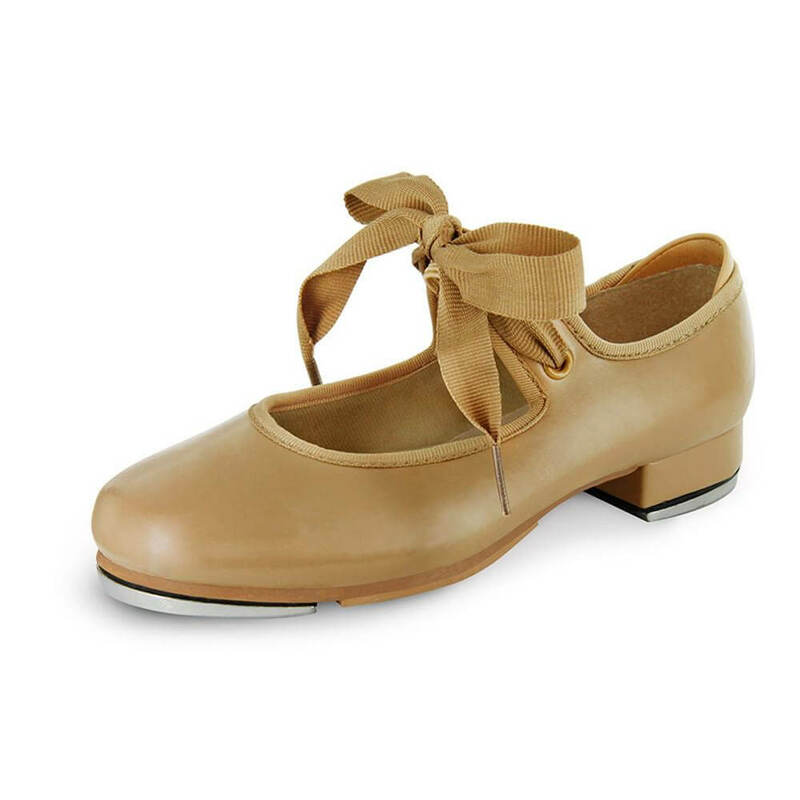 Bloch Girls Chloe and Maud Leather Tap Shoes S0327G: Incorporating fierce footwork and feminine style, the dancing duo sisters Chloe and Maud have taken the tap world by storm. And now you can too! 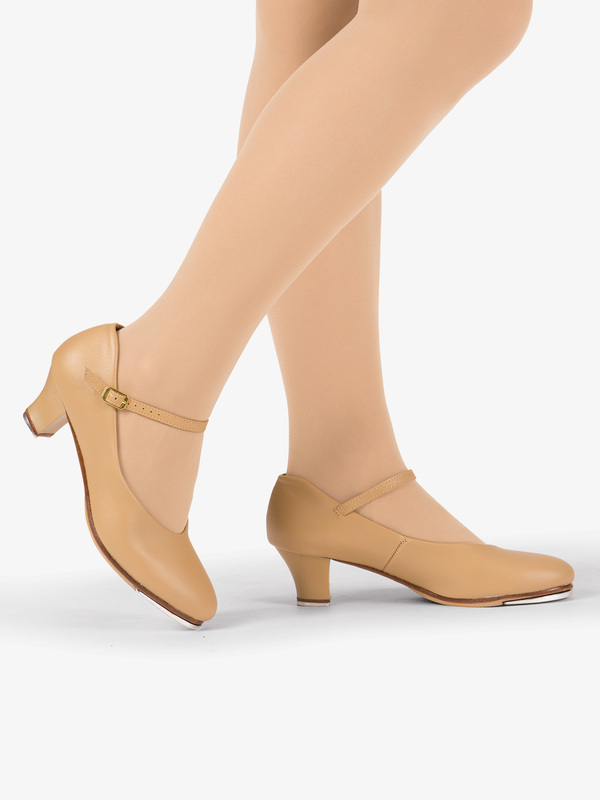 The Chloe and Maud-inch Bloch shoes, designed and loved by the sisters themselves, feature audio engineered Bloch Mega taps, a rich tone in the toe, and a deep tone in the heel. Shoes also include a removable Chloe and Maud heart charm. 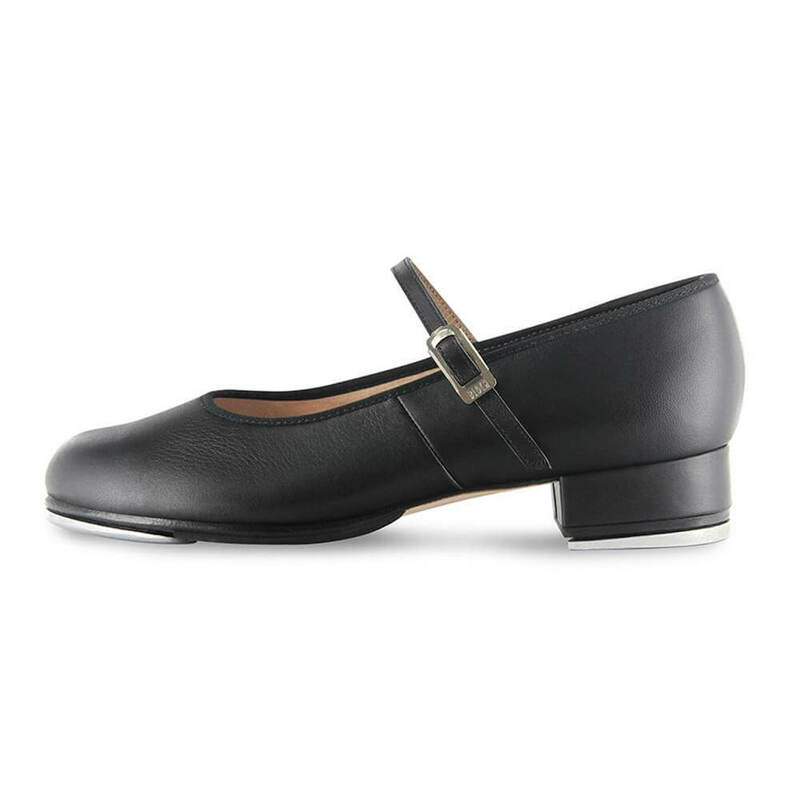 Bloch Womens Chloe and Maud Leather Tap Shoes S0327L: Incorporating fierce footwork and feminine style, the dancing duo sisters Chloe and Maud have taken the tap world by storm. And now you can too! 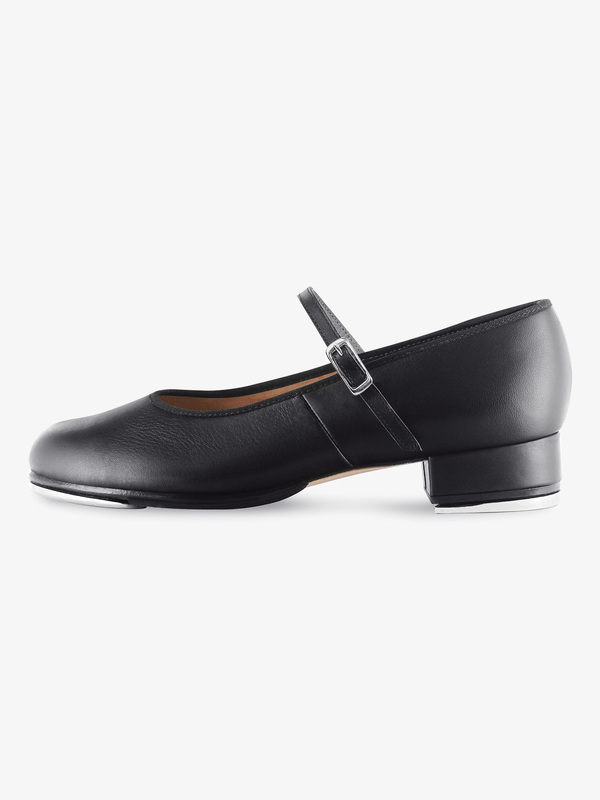 The Chloe and Maud-inch Bloch shoes, designed and loved by the sisters themselves, feature audio engineered Bloch Mega taps, a rich tone in the toe, and a deep tone in the heel. Shoes also include a removable Chloe and Maud heart charm. 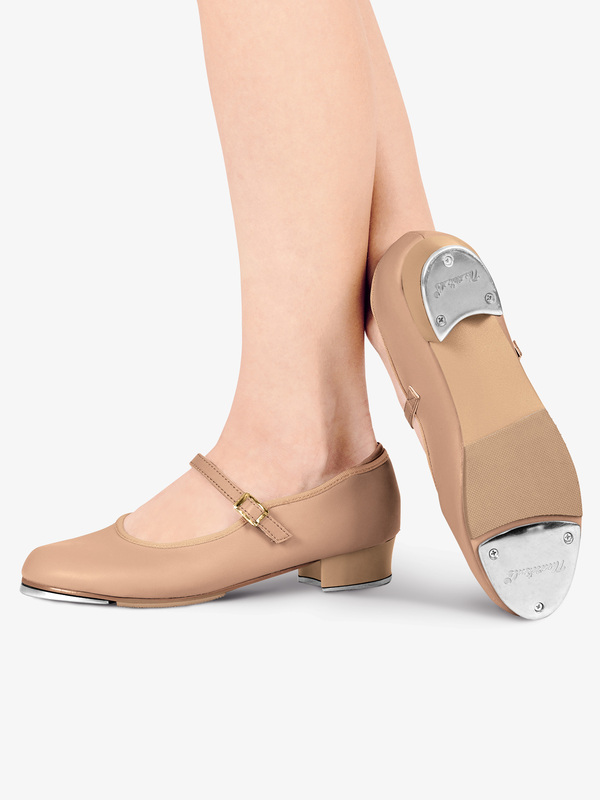 Capezio Adult Mary Jane Buckle Strap Tap Shoes 3800: Capezio's adult Mary Jane-inch tap shoe features attached Teletone Taps, a buckle strap, a 1 inch plastic stacked-inch heel, a non-slip heel counter and cushioned latex foam insole providing extra comfort. The Black Patent version features a PU upper and the other color versions feature a matte genuine leather upper. Clip-on bows are not included with the adult version. 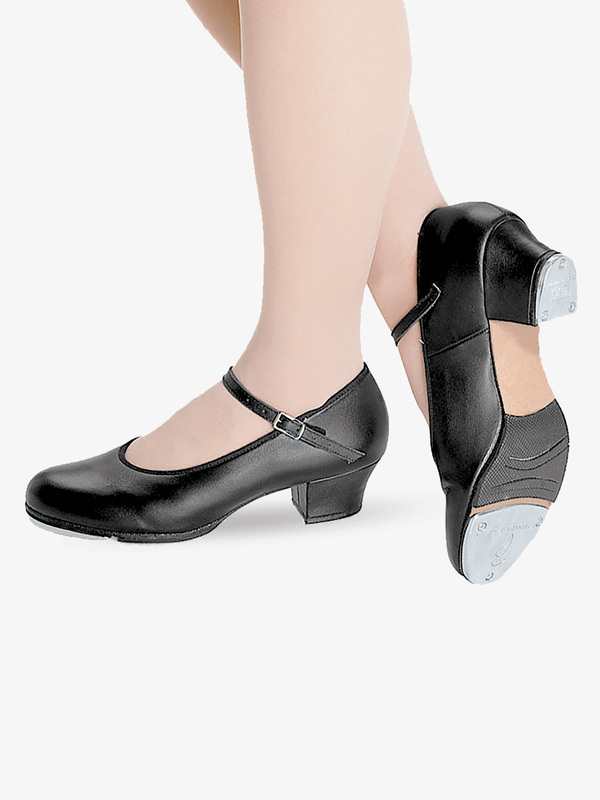 Capezio Child Mary Jane Buckle Strap Tap Shoes 3800C: Capezio's child Mary Jane-inch tap shoe features attached Teletone Taps, a velcro strap with an ornamental buckle, a 1-inch plastic stacked-inch heel, a non-slip heel counter and a cushioned latex foam insole providing extra comfort. The Black Patent version features a PU upper and the other color versions feature a matte genuine leather upper. Clip-on bows are included! 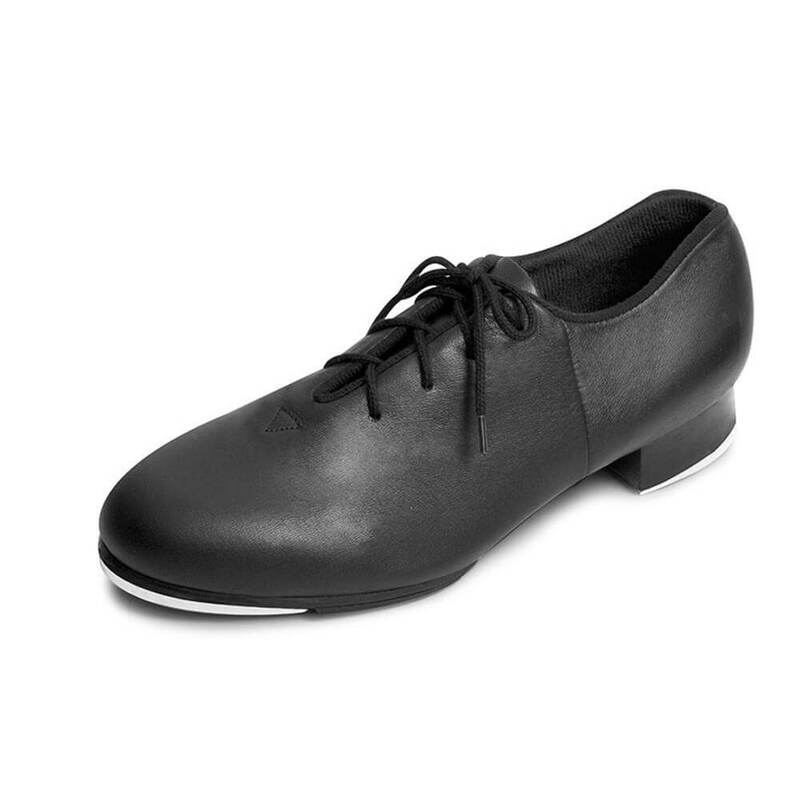 Capezio Adult Tic Tap Toe Lace-Up Tap Shoes 443: The sleek Tic Tap Toe-inch lace up tap shoe is ideal for beginner tappers. Features a seamless side profile, soft PU upper, plush and absorbent brushed microfiber lining, a lightly padded footbed, Achilles pad for comfort, and a rubber sole patch. 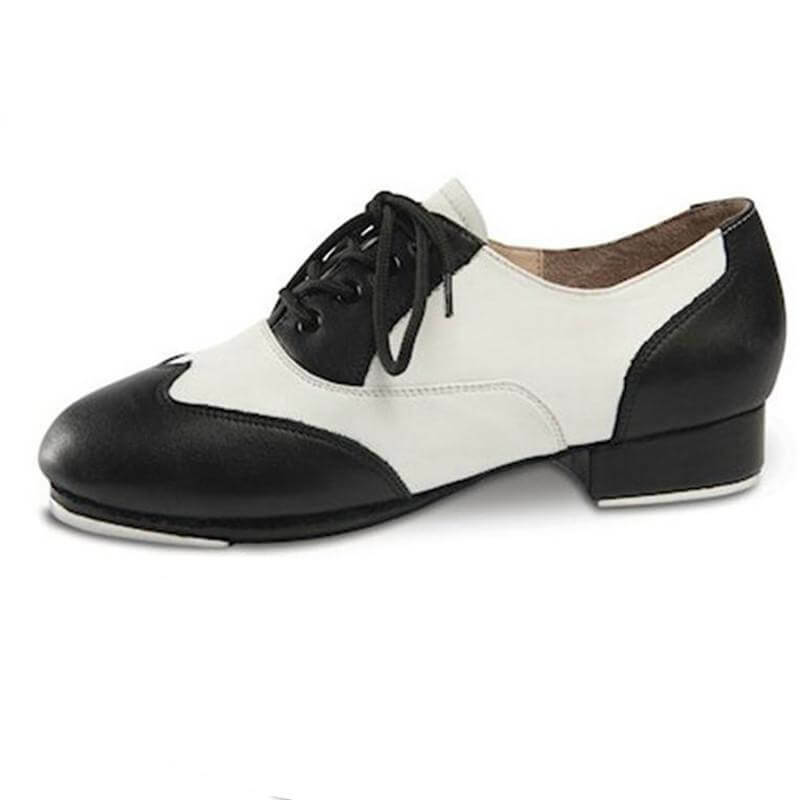 Comes with Capezio's popular Tele Tone taps. 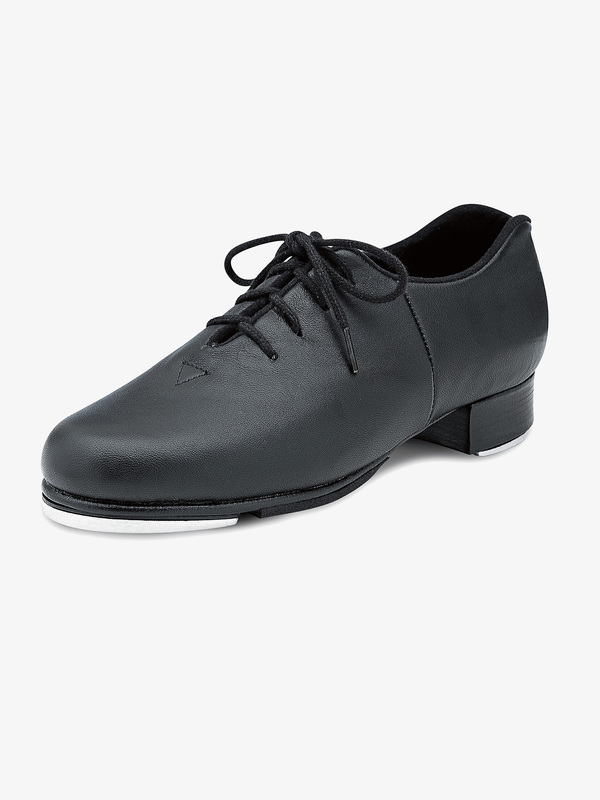 Capezio Boys Tic Tap Toe Lace-Up Tap Shoes 443B: The sleek Tic Tap Toe-inch lace up tap shoe is ideal for beginner tappers. Features a seamless side profile, soft PU upper, plush and absorbent brushed microfiber lining, a lightly padded footbed, Achilles pad for comfort, and a rubber sole patch. 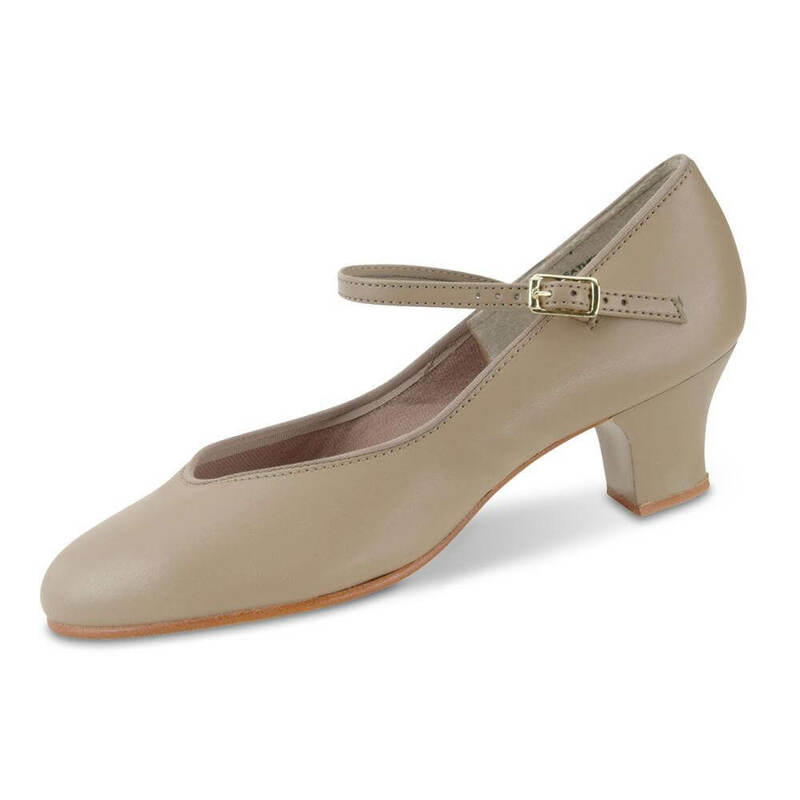 Comes with Capezio's popular Tele Tone taps. 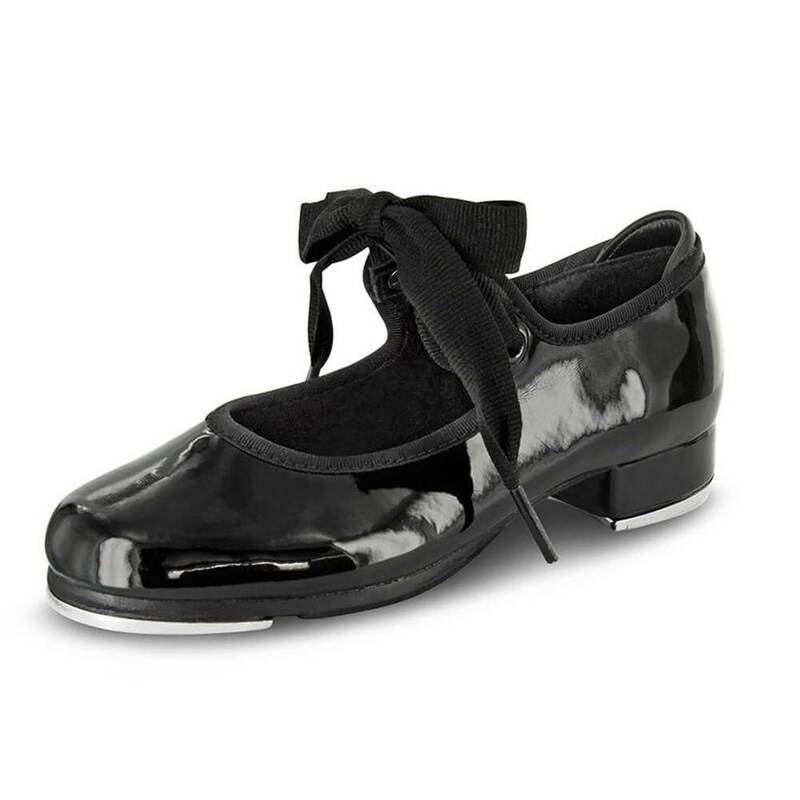 Capezio Child Tic Tap Toe Lace-Up Tap Shoes 443C: The sleek Tic Tap Toe-inch lace up tap shoe is ideal for beginner tappers. 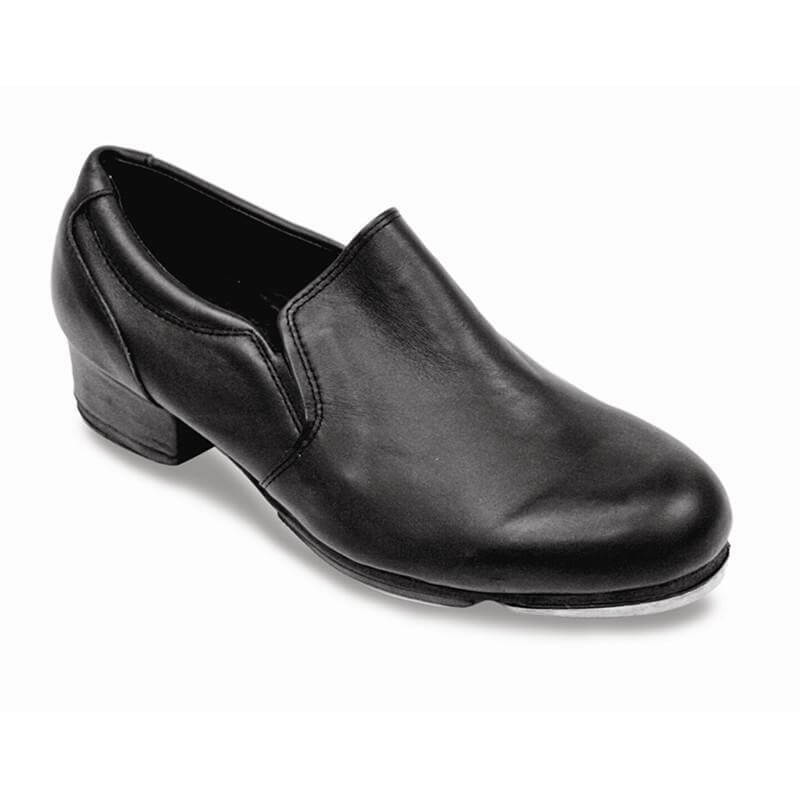 Features a seamless side profile, soft PU upper, plush and absorbent brushed microfiber lining, a lightly padded footbed, Achilles pad for comfort, and a rubber sole patch. 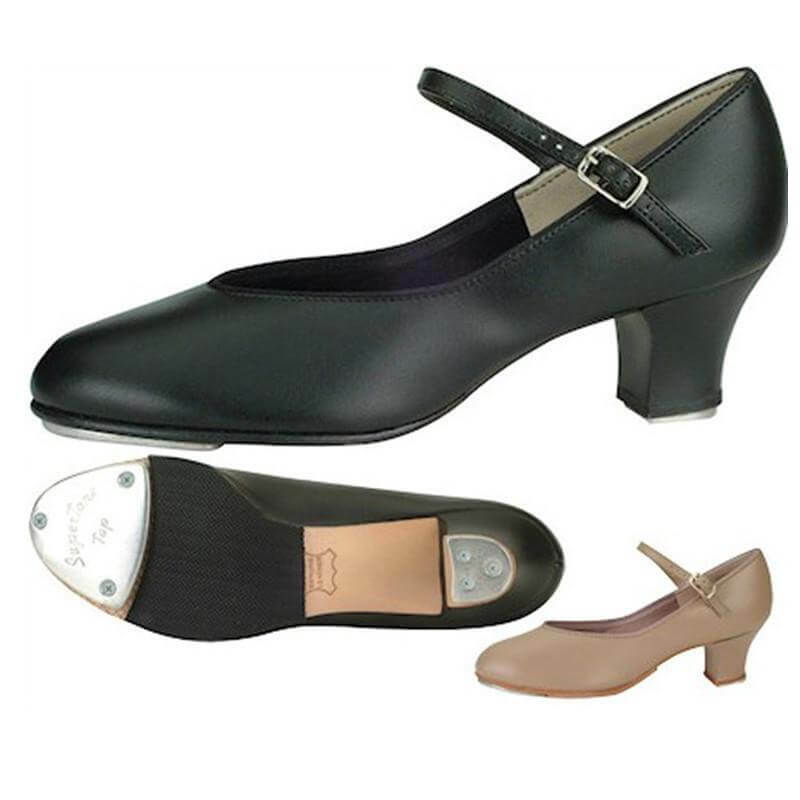 Comes with Capezio's popular Tele Tone taps. 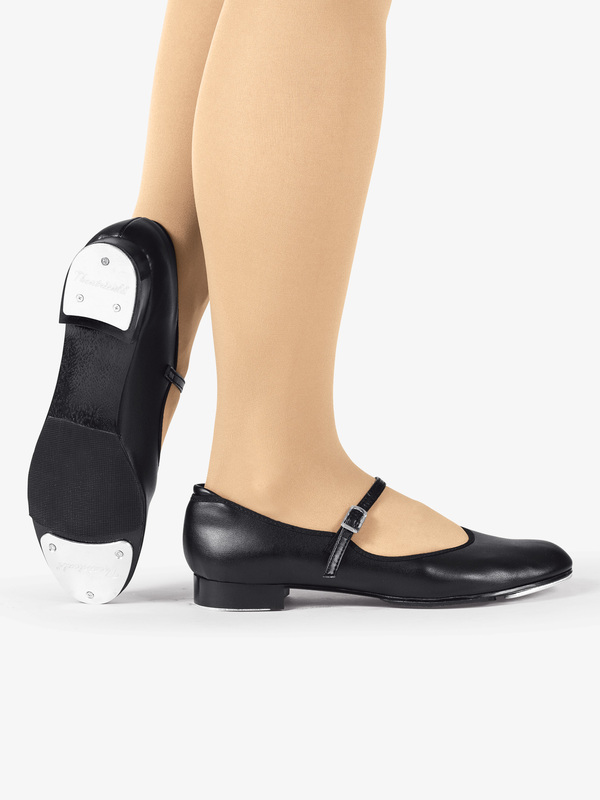 Capezio Adult Leather Jr. Footlight 1.5 Heel Tap Shoes 561: Capezio's Jr. Footlight-inch tap shoe features an upper constructed of soft, supple, quality leather. 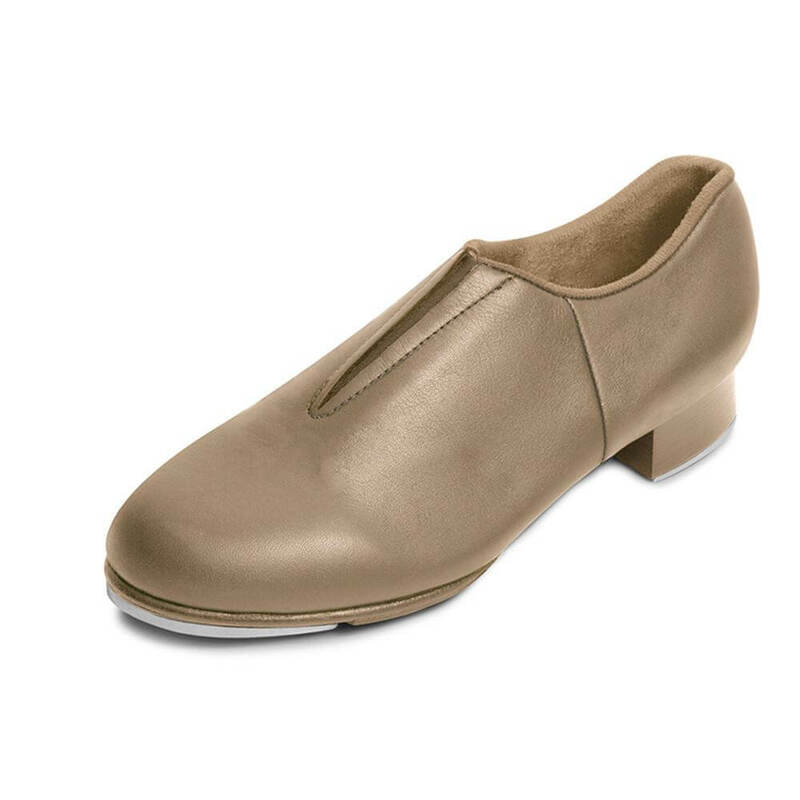 This shoe is lined with moisture absorbing brushed microfiber and other features include a padded insole with arch support, scored leather sole with scored rubber sole patch, a non-slip heel counter, 1.5-inch fully covered heel and TeleTone toe tap and DuoTone heel taps. 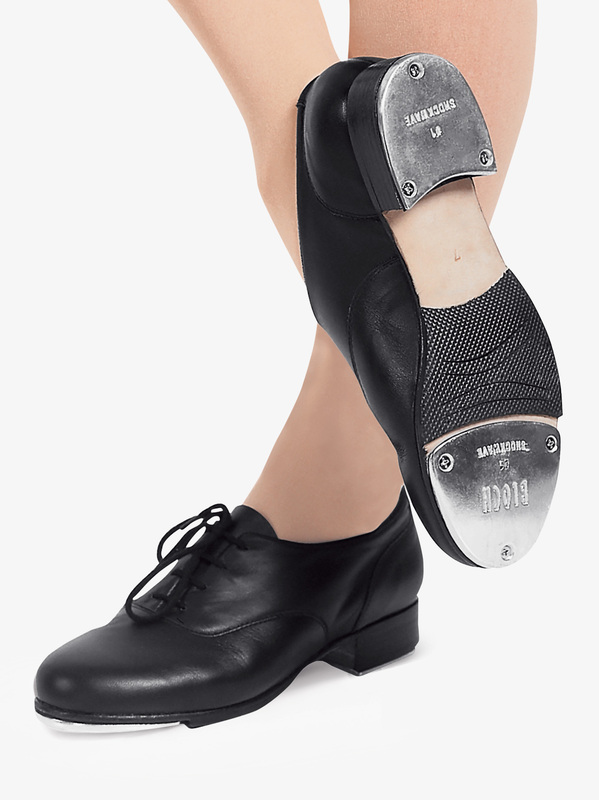 Capezio Adult Fluid Lace Up Tap Shoes CG17: Capezio's Fluid-inch tap shoe features a suede flexible outsole with light texon board shank for flexibility with support. 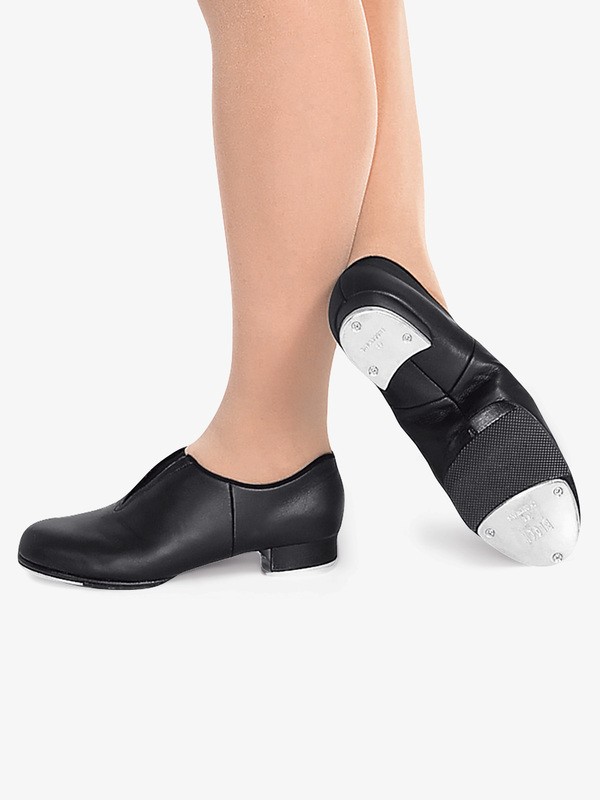 Other features include a PU upper, Achilles notch, plastic heel, moisture absorbing microfiber lining, folded edges, and padded collar for comfort and Capezio TeleTone taps. 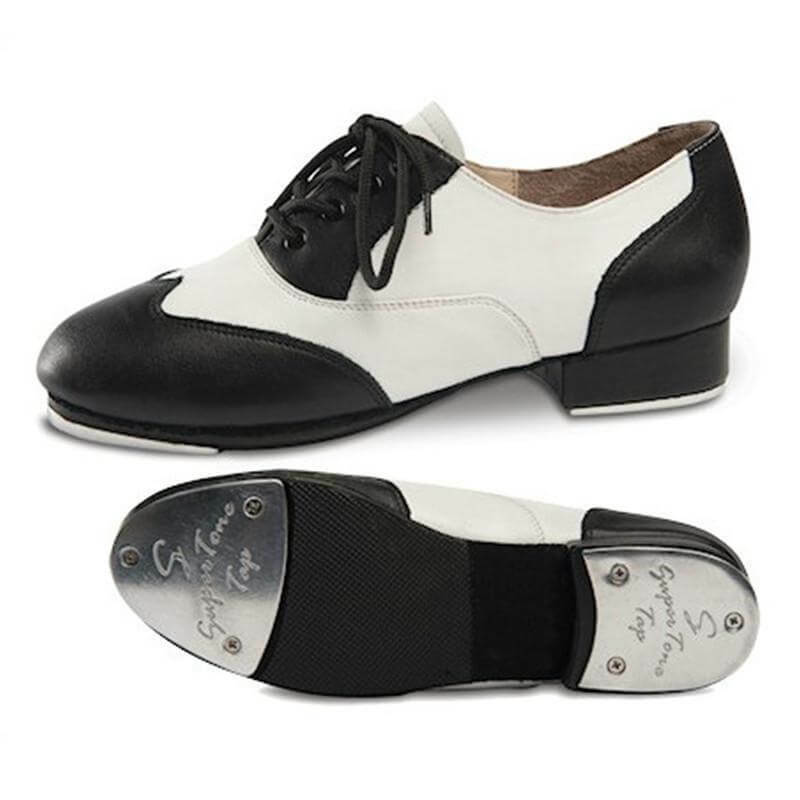 Capezio Child Fluid Lace Up Tap Shoes CG17C: Capezio's Fluid-inch tap shoe features a suede flexible outsole with light texon board shank for flexibility with support. 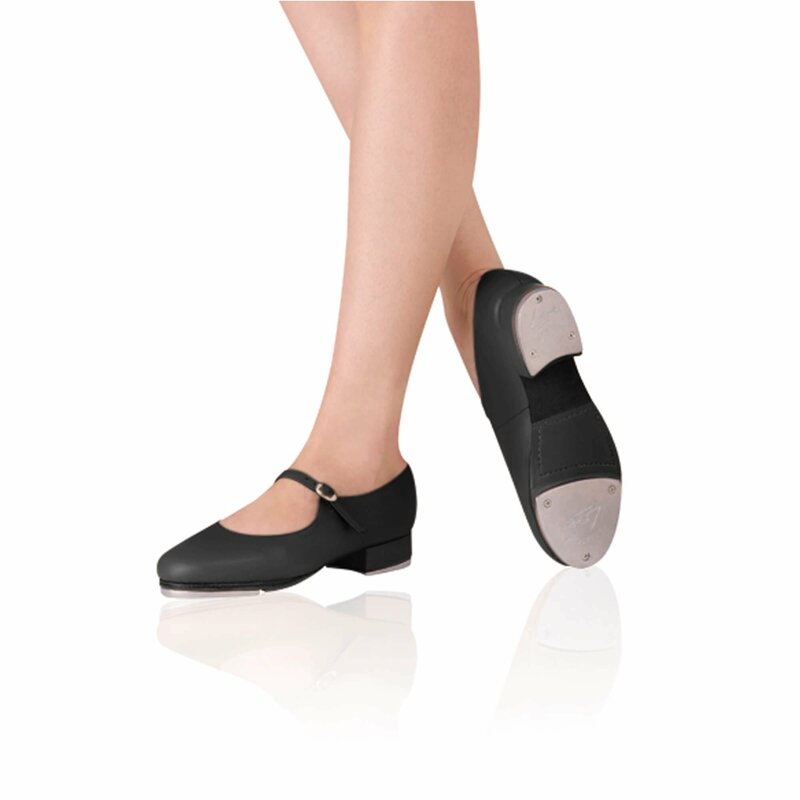 Other features include a PU upper, Achilles notch, plastic heel, moisture absorbing microfiber lining, folded edges and padded collar for comfort and Capezio TeleTone taps. 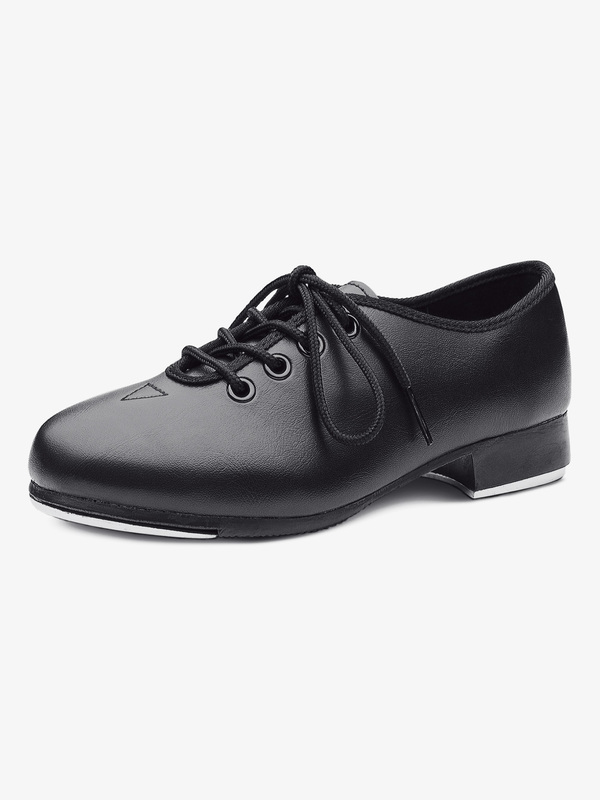 Bloch Child Lace Up Tap Shoes S0301G: From Bloch, a jazz-style upper of durable, soft leather combined with a full leather sole and reinforced toe box makes this a strong, stable tap shoe. The taps are secured to a resonating board for a full sound and perfect stability. Rubber pad on metatarsal. 1-inch heel Techno Taps. 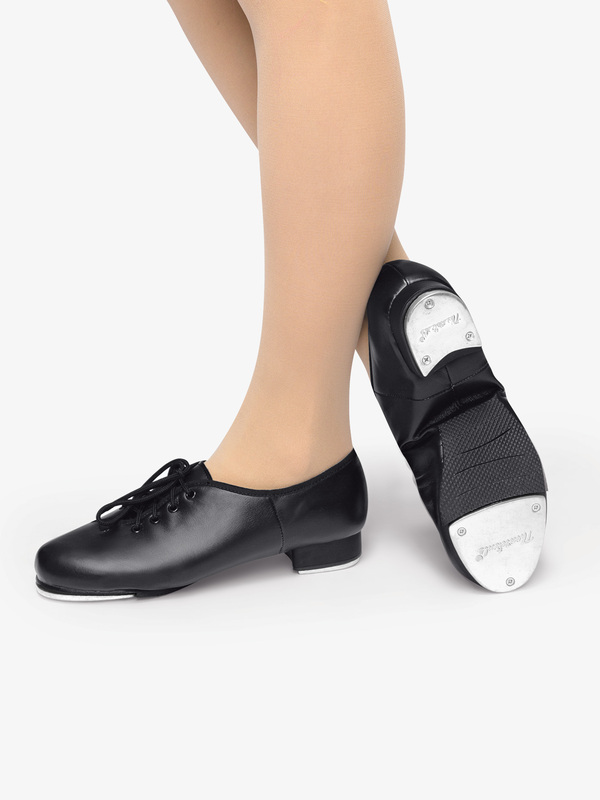 Bloch Adult Lace Up Tap Shoes S0301L: From Bloch, a jazz-style upper of durable, soft leather, combined with a full leather sole and reinforced toe box makes this a strong, stable tap shoe. The taps are secured to a resonating board for a full sound and perfect stability. Rubber pad on metatarsal. 1-inch heel Techno Taps. 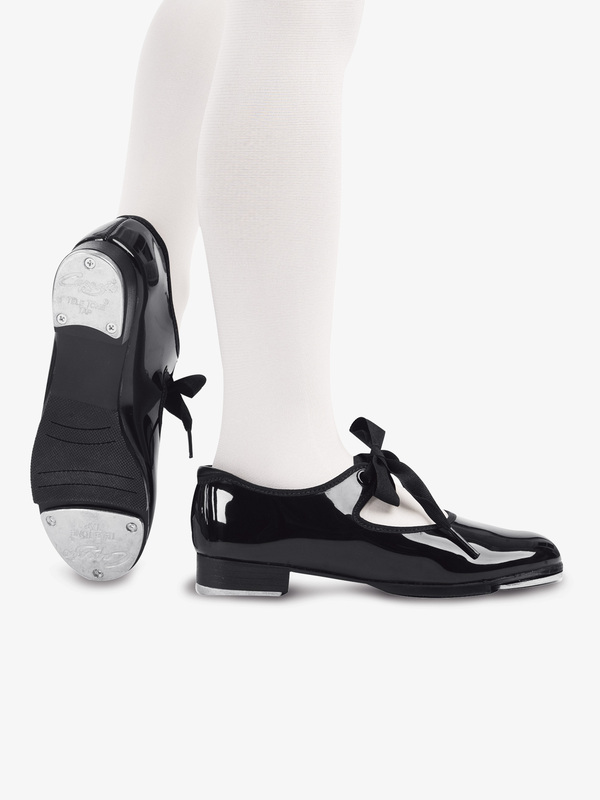 Bloch Child Tap-On Buckle Tap Shoes S0302G: Bloch's leather upper, leather sole tap shoe with 3/4 heel. The buckle is attached by elastic for a firmer fit and the taps are screwed on top of a resonating board. Also featuring a rubber pad on the metatarsal that will add comfort while helping to prevent skidding. 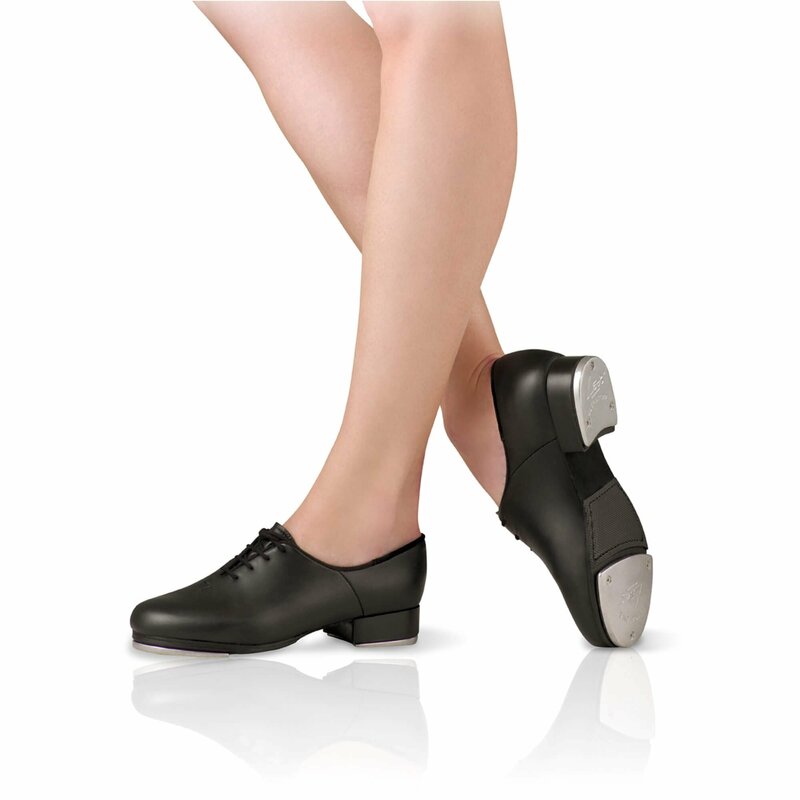 Bloch Adult Tap-On Buckle Tap Shoes S0302L: Bloch's leather upper, leather sole tap shoe with ¾-inch heel. The buckle is attached by elastic for a firmer fit and the taps are screwed on top of a resonating board. Also featuring a rubber pad on the metatarsal that will add comfort while helping to prevent skidding. Capezio Womens Leather Lace Up Tap Shoes K543: Perfect for all levels of tap - this classic tap shoes feature a lace-up design, Tele Tone toe and heel taps, a Spring Tec insole and sock lining for increased comfort, a foam padded tongue and collar, and a strong toe box. 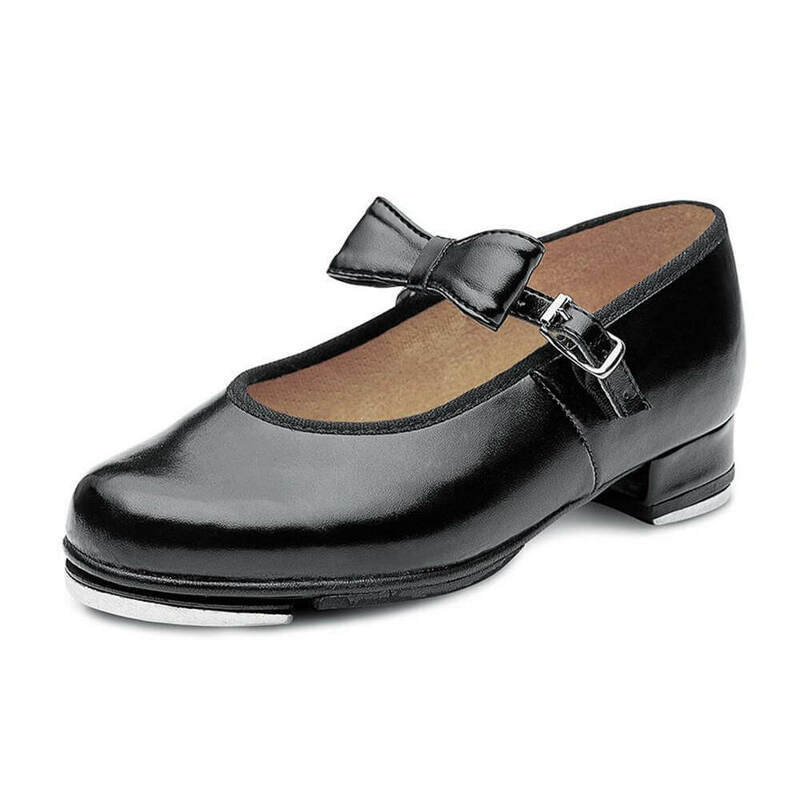 Capezio Adult Jr. Tyette Ribbon Tie Tap Shoes N625: Capezio's Jr. Tyette-inch tap shoe features a firm heel counter and light toe box for support and a snug fit while maintaining comfort. 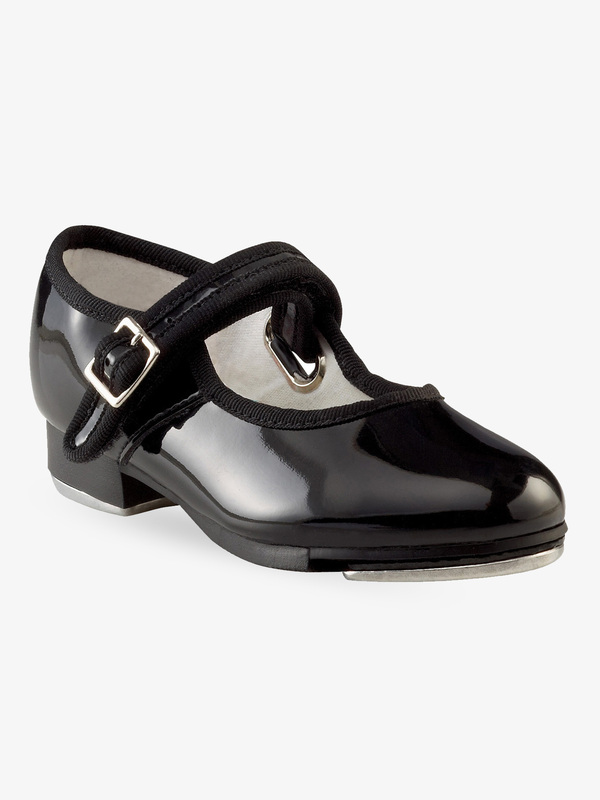 The black patent features a PVC upper while the other colors feature a matte PU upper. 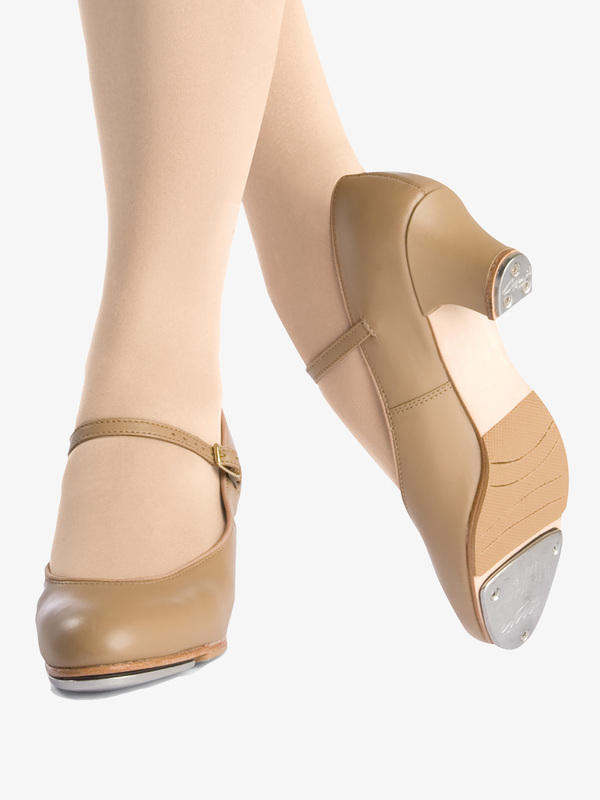 Other features include TeleTone toe and heel taps, foam padded footbed, grosgrain ribbon, and an adorable star sock lining print. The elastic is sewn between the eyelets. 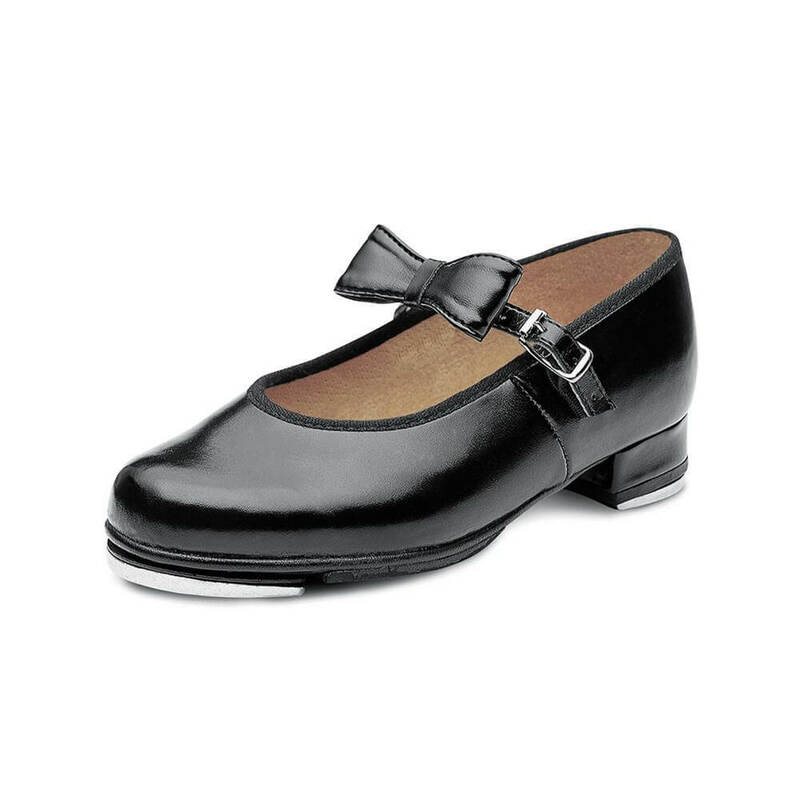 Capezio Child Jr. Tyette Ribbon Tie Tap Shoes N625C: Capezio's Jr. Tyette-inch tap shoe features a firm heel counter and light toe box for support and a snug fit while maintaining comfort. The black patent features a PVC upper while the other colors feature a PU upper. 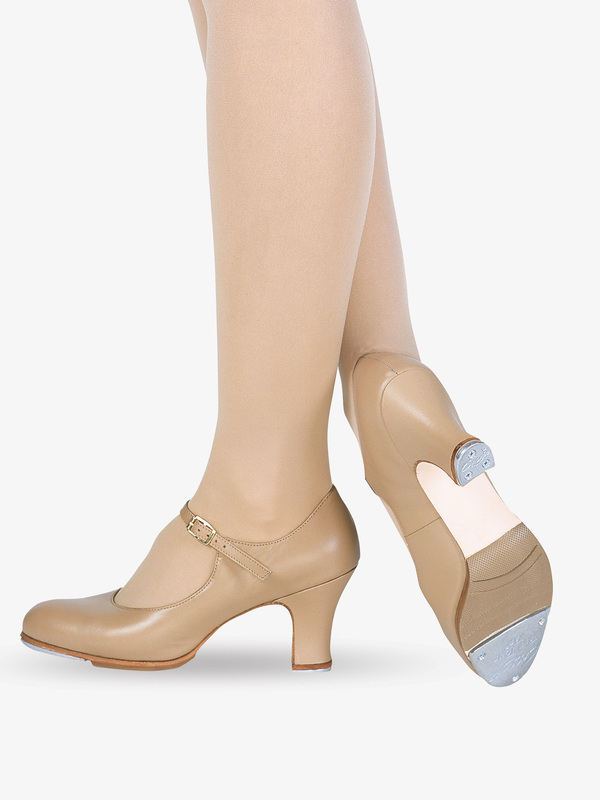 Other features include TeleTone toe and heel taps, foam padded footbed, grosgrain ribbon, and an adorable star sock lining print. White and Tan colors have a matte finish. The elastic is sewn between the eyelets. 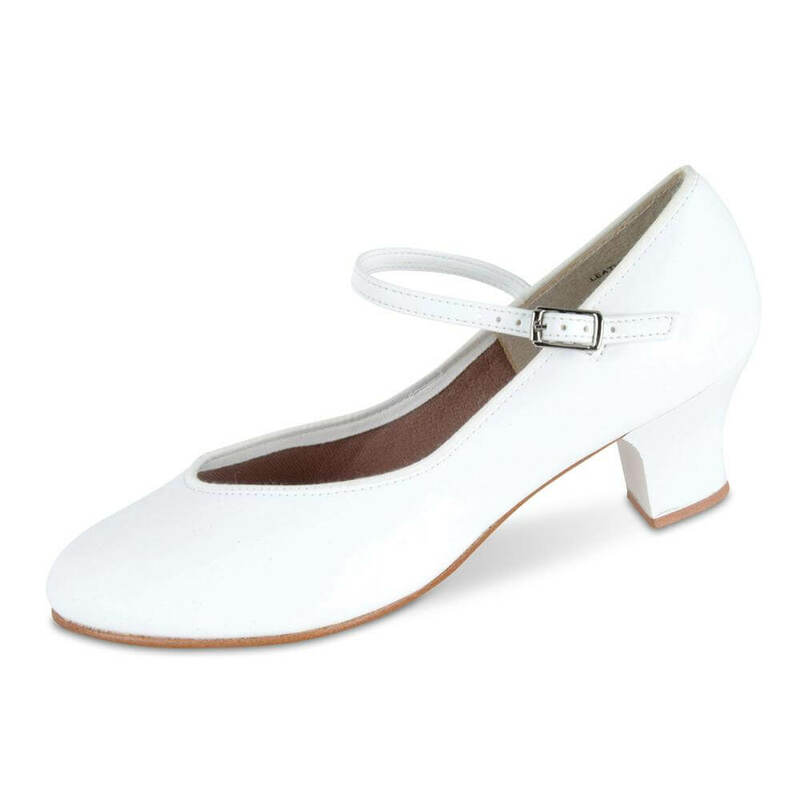 Theatricals Adult 1.5 Heel Baby Louis Character Tap Shoes T9800: This 1.5-inch heel character shoe has a genuine imitation leather upper and a leather sole. Features include attached taps with sound boards, a non-skid rubber patch for safety, and a cushioned sock lining. Ankle strap is secured with an adjustable pin buckle for easy on/off. 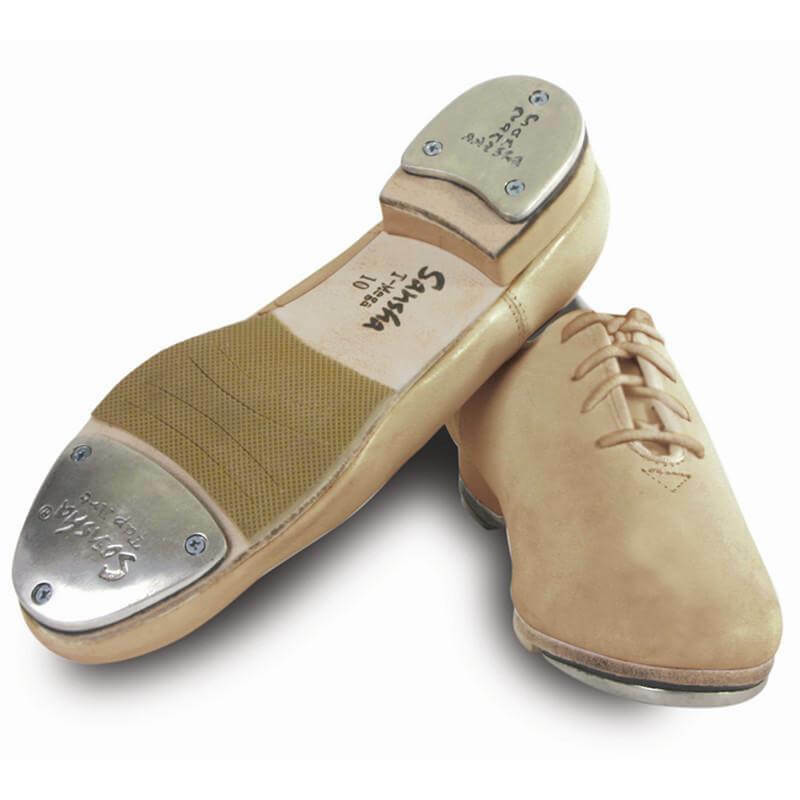 Bloch Jason Samuels Smith Tap: These lace-up tap shoes were designed in a coordinated effort by Bloch and tap icon Jason Samuels Smith to create a quality professional tap shoe at an economical price. 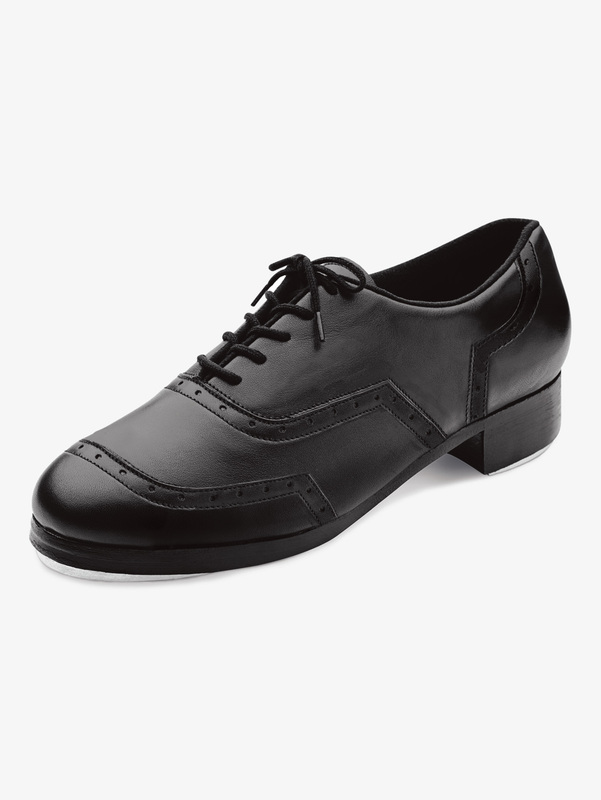 Shoes feature an Oxford leather upper and a double hard leather outsole with a triple stacked 1" heel. Steel resonance plates between the tap and outsole result in astounding depth and pitch of sound in the studio or on stage. Kashmir lining keeps feet dry and comfortable during any routine. Bloch's specially developed metal bonding procedure ensures that screws stay put. Separate slip pad included. Imported.Suggested Fitting : Start with 1 full size larger than street shoe size. 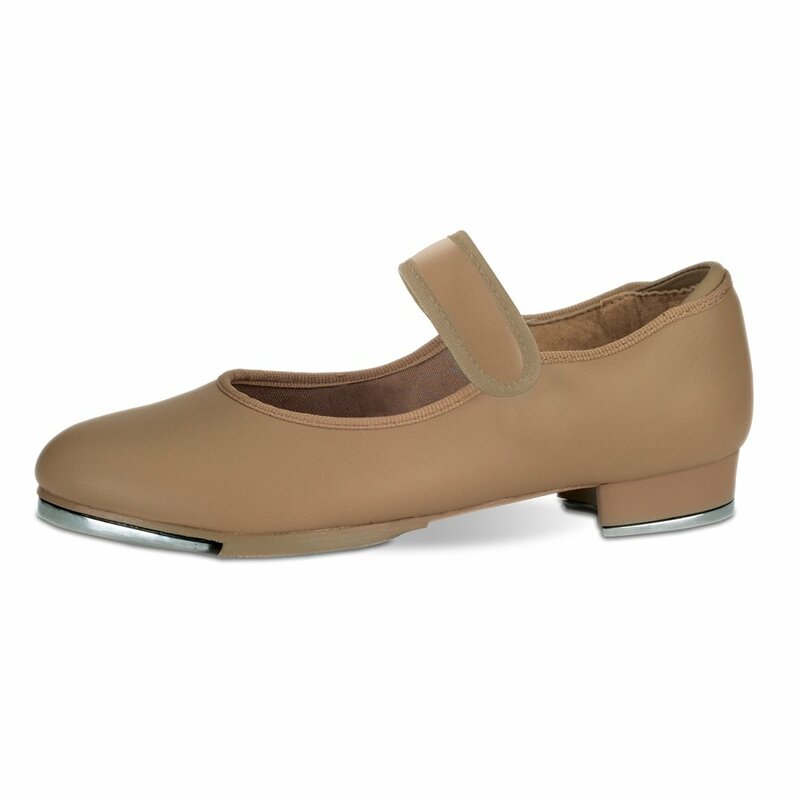 Many more dancewear and shoe styles on sale at Danzia.com and Discount Dance Supply.